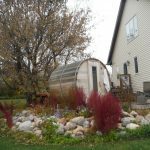 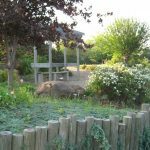 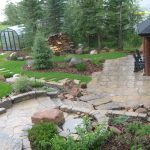 Virginia Yakimovich is a Certified Horticulturalist, Journeyman Landscape Gardener and Landscape Designer. 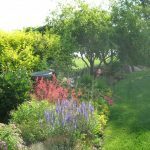 She has been in the landscape business for over 25 years, and in commercial floristry for over 30 years. 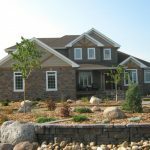 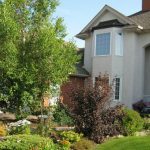 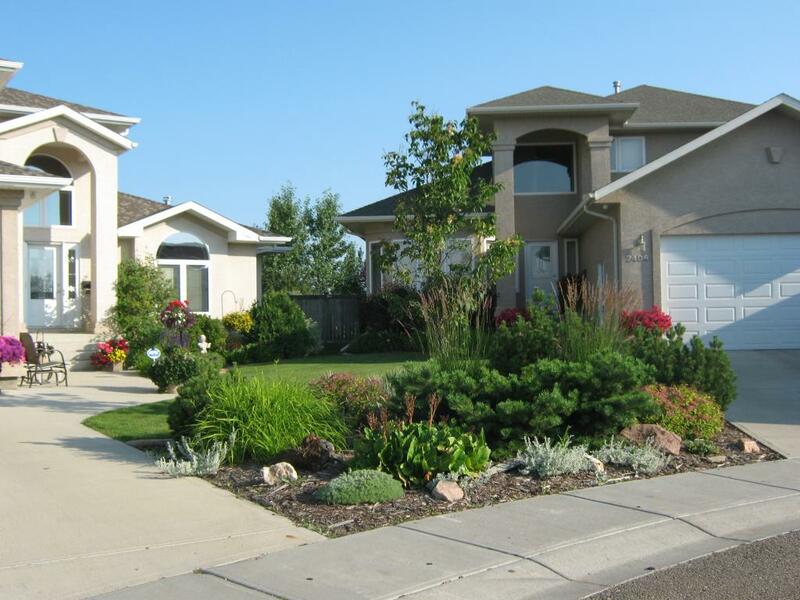 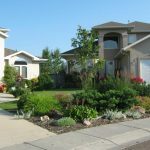 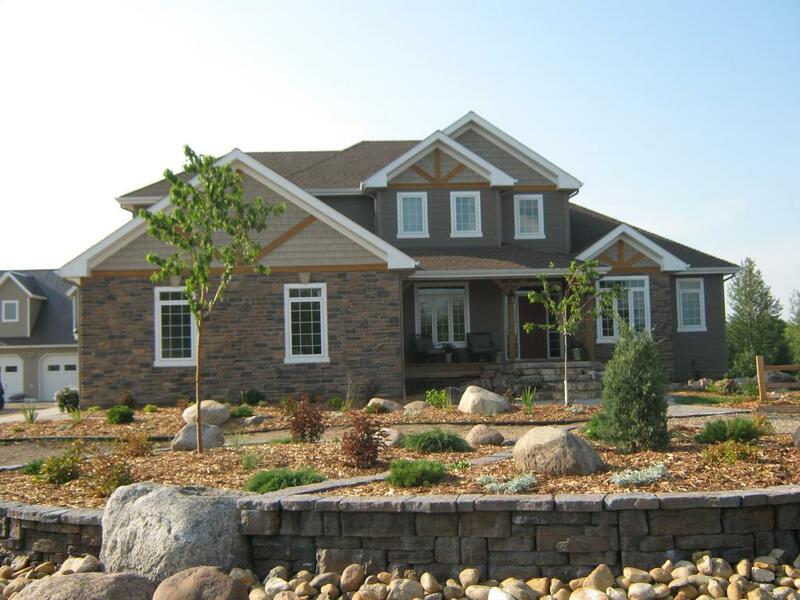 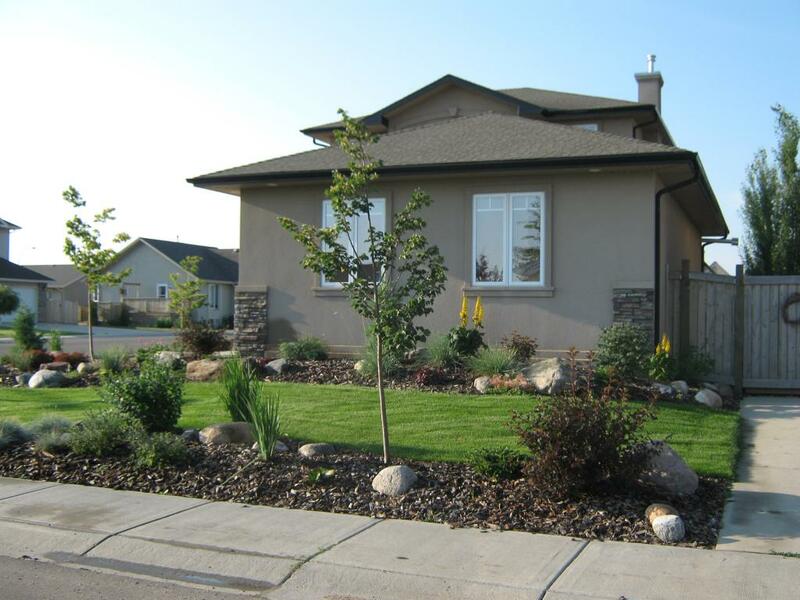 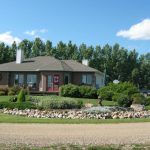 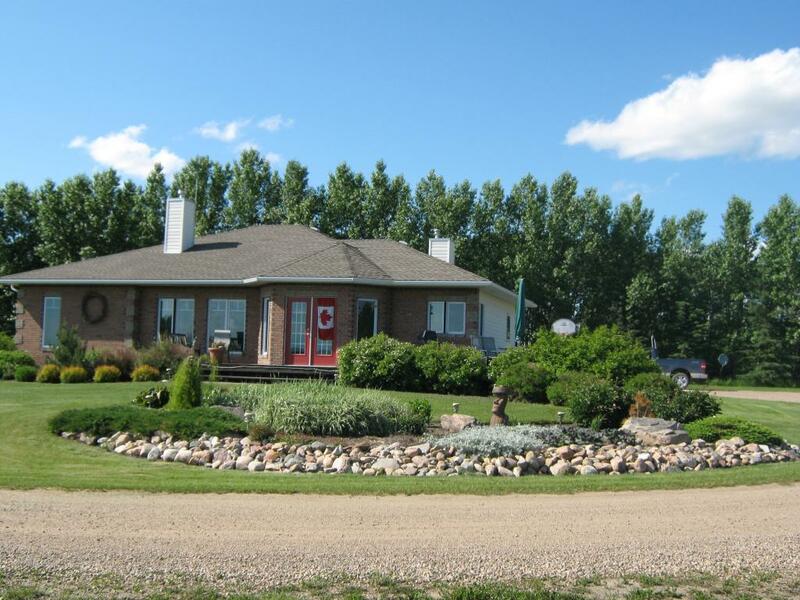 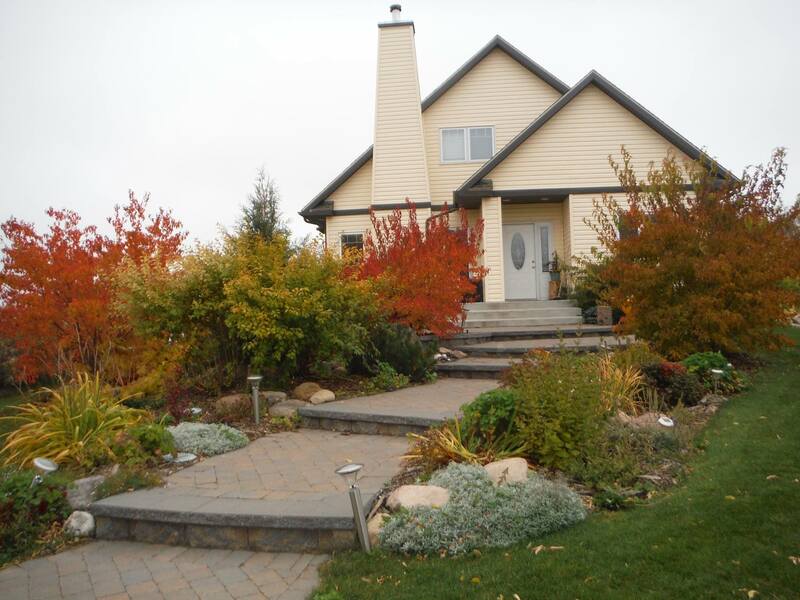 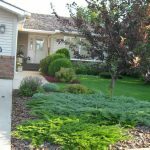 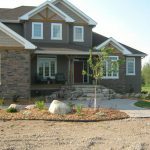 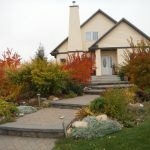 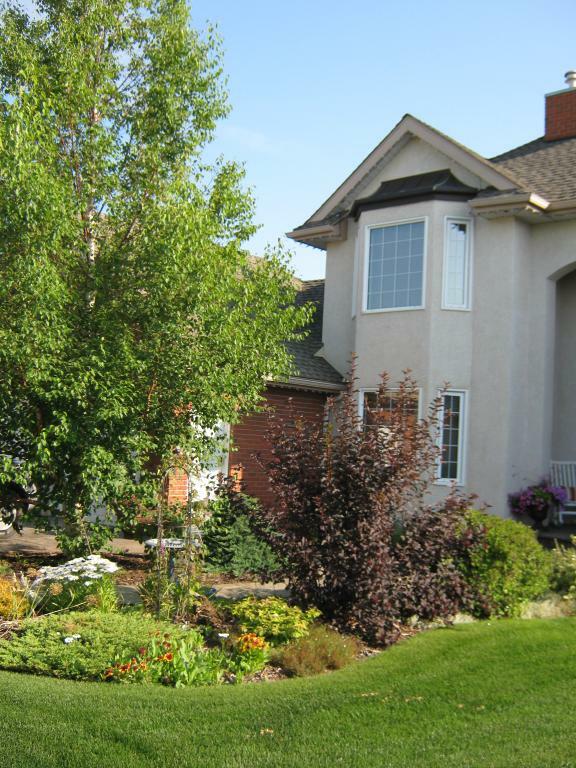 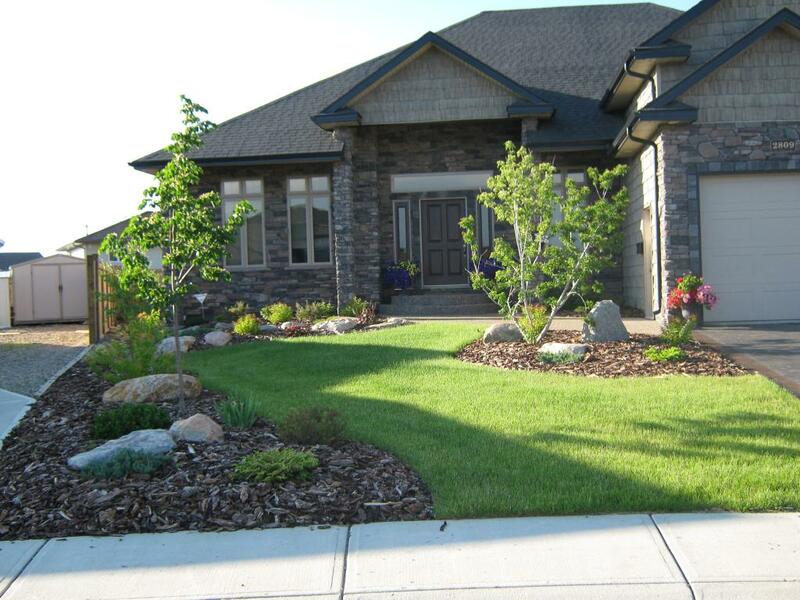 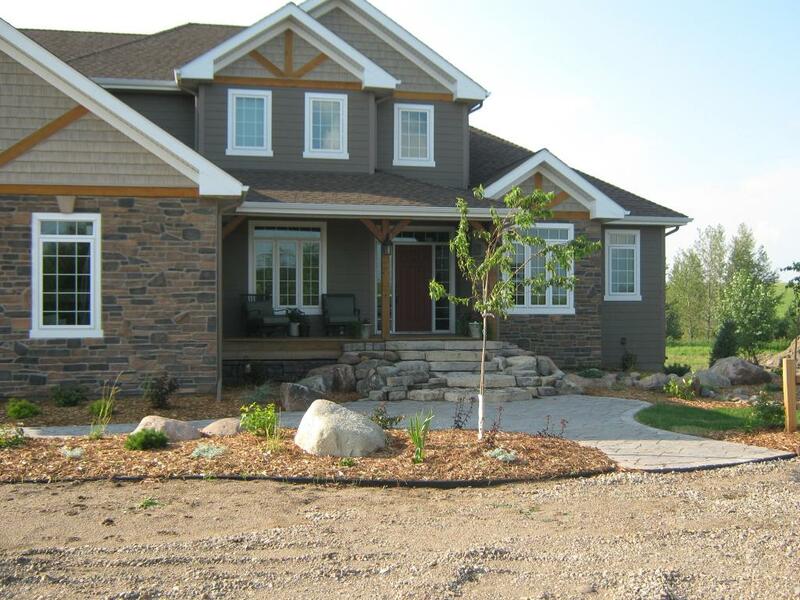 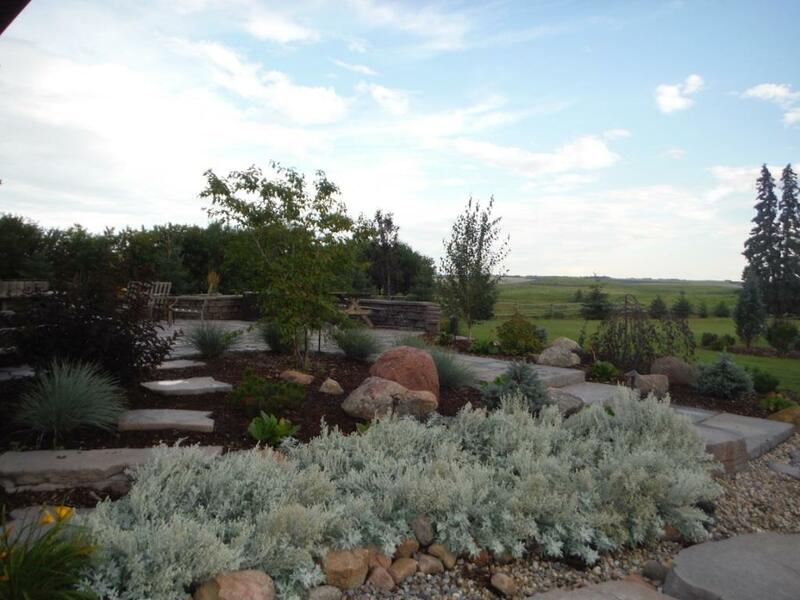 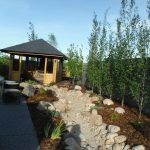 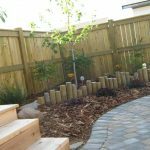 A professional landscape plan is an investment in your property. 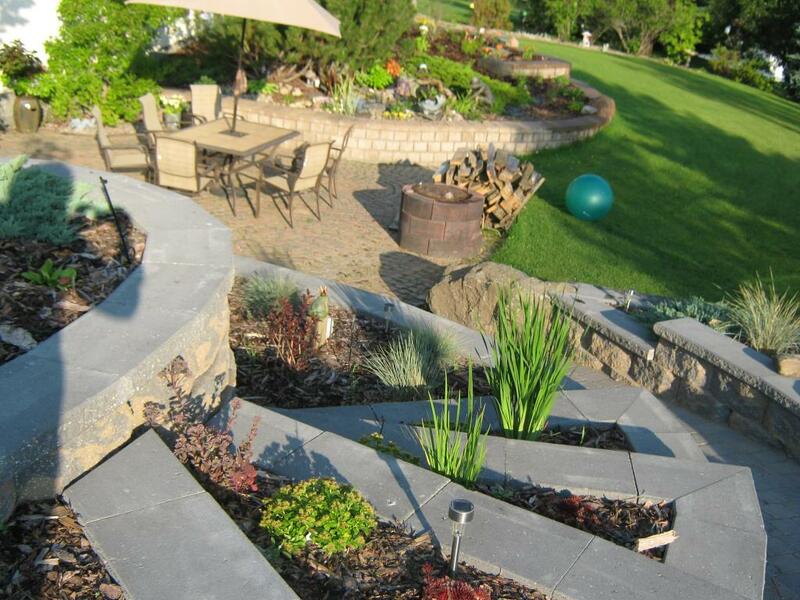 Studies have shown that a quality landscape can increase the value of a home by 15 – 20 percent. 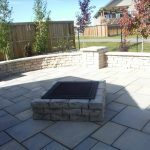 Outdoor living spaces increase the usable portion of the property and create opportunities for entertaining, relaxing, and hobby gardening. 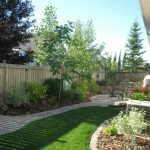 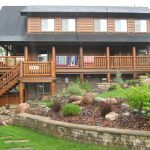 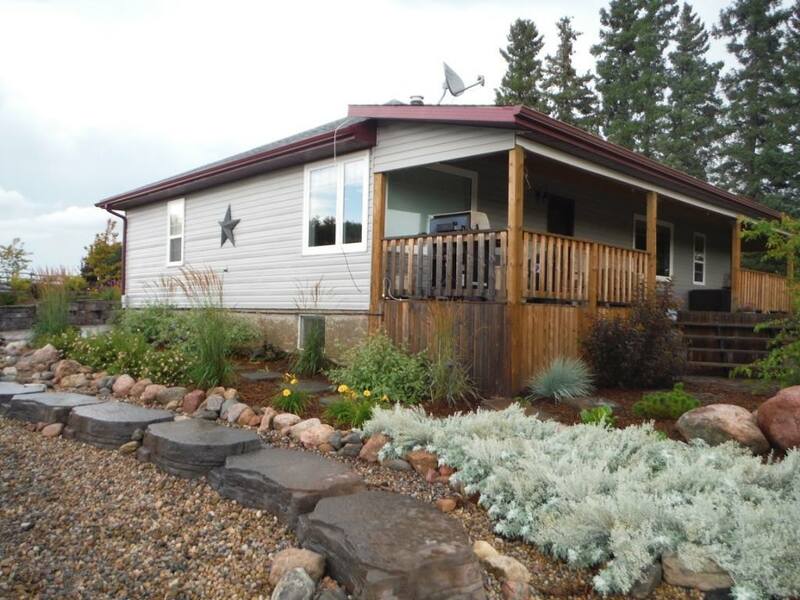 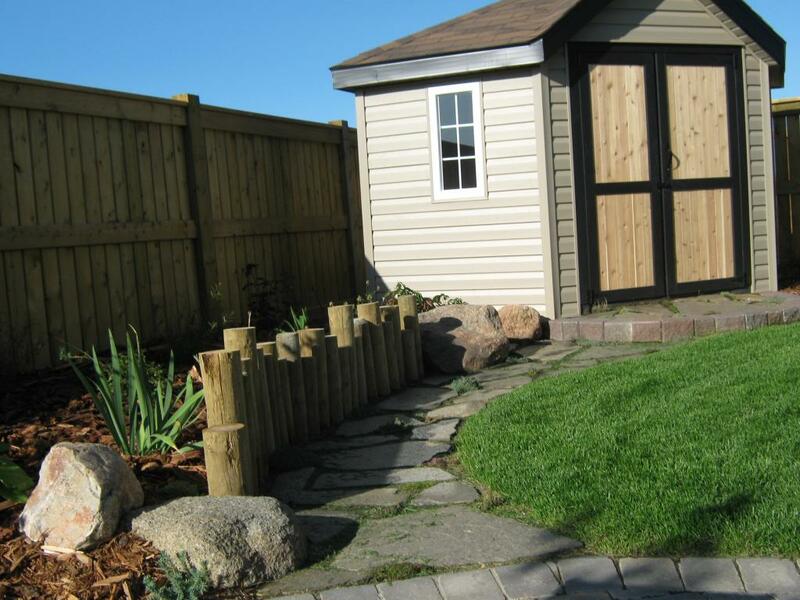 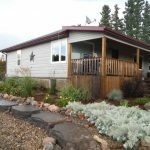 Designing the perfect yard for each situation is a challenge we enjoy. 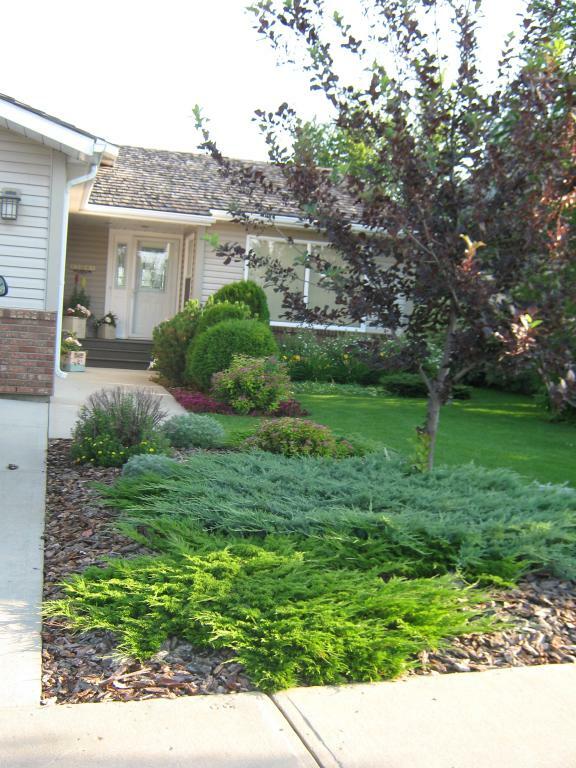 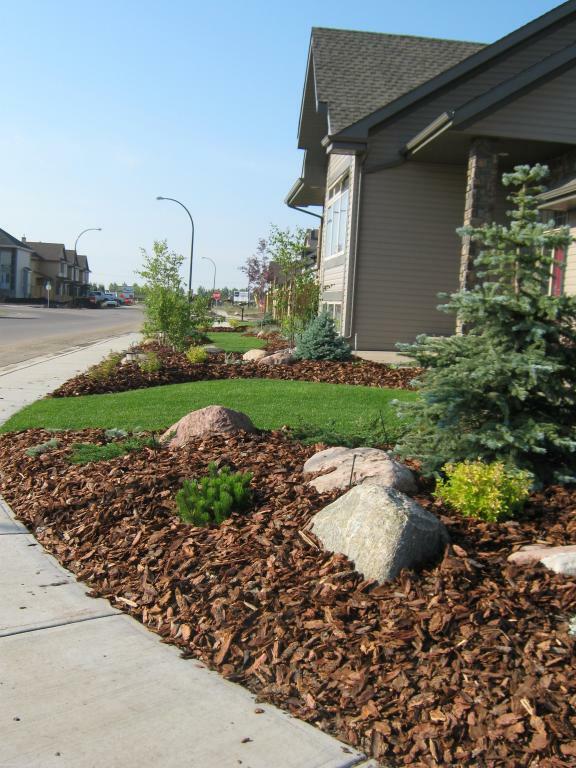 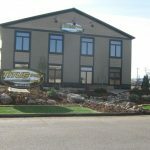 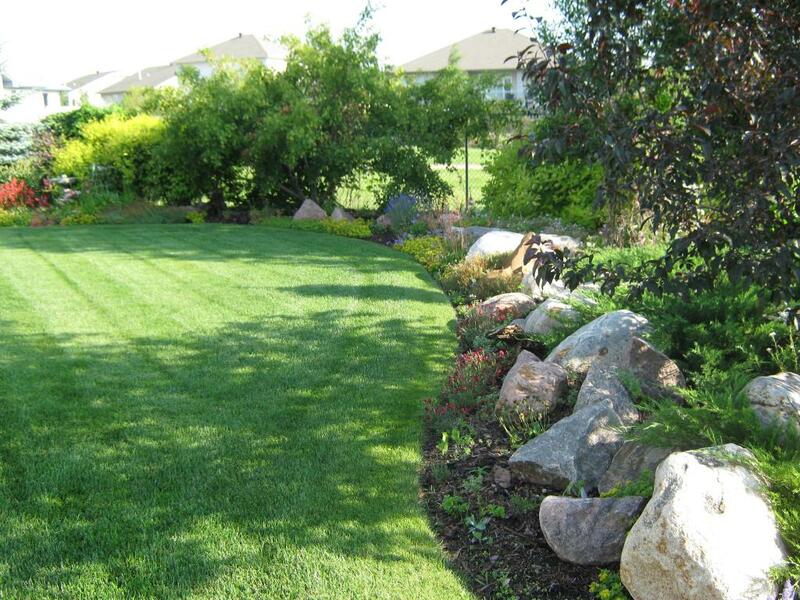 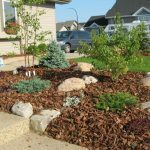 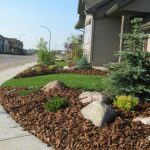 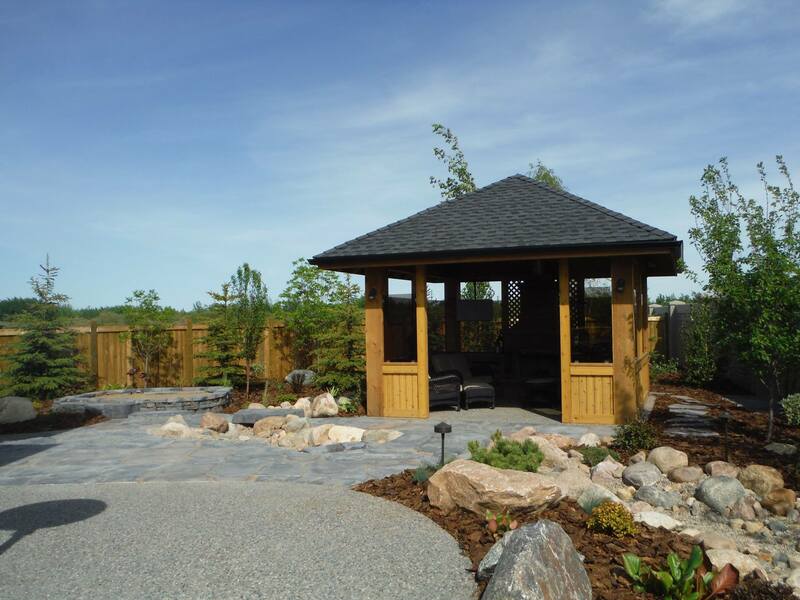 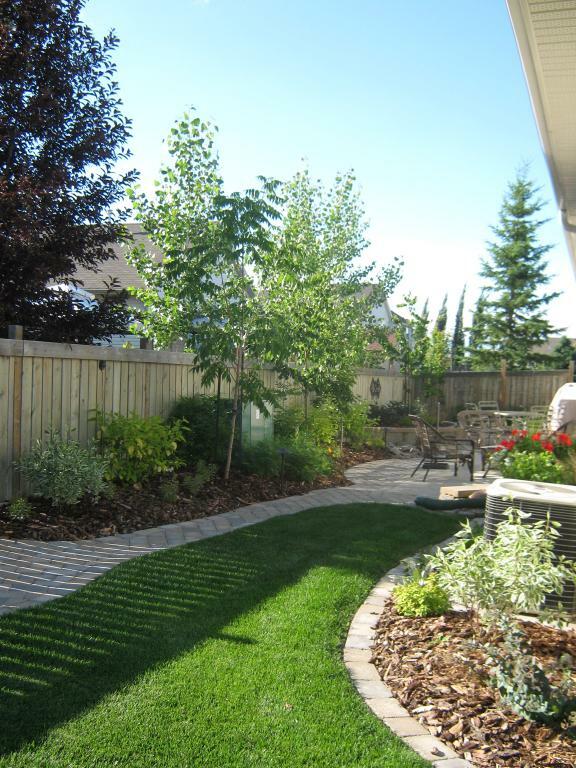 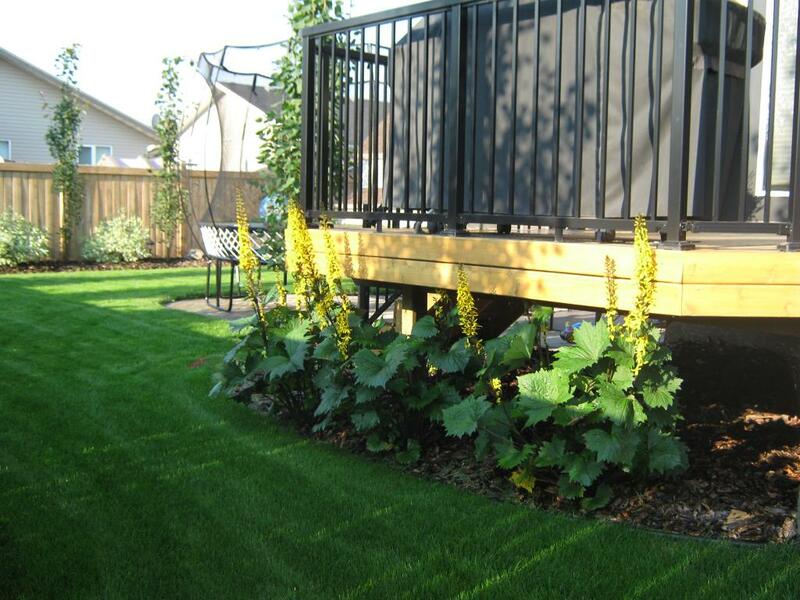 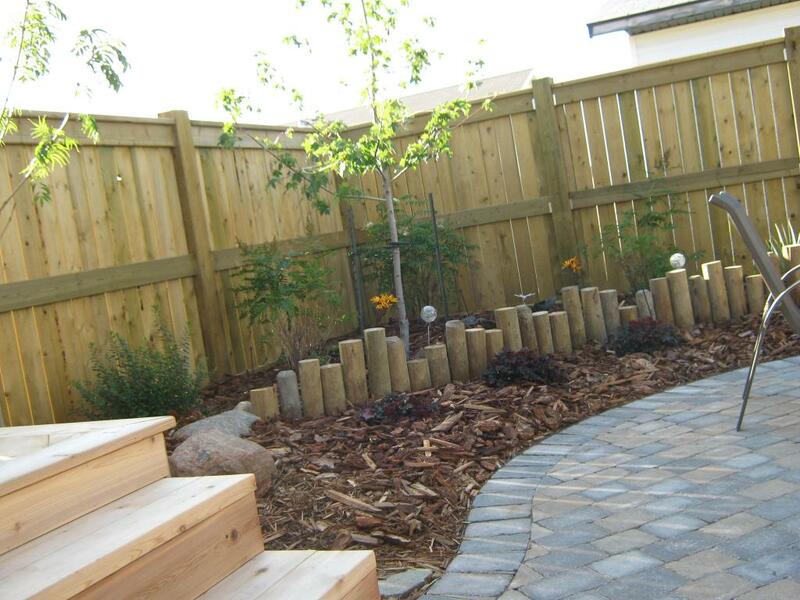 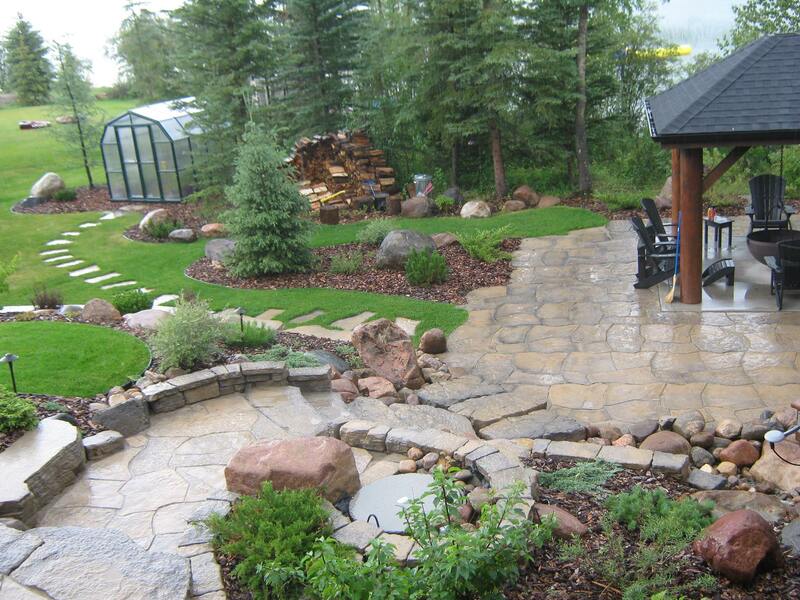 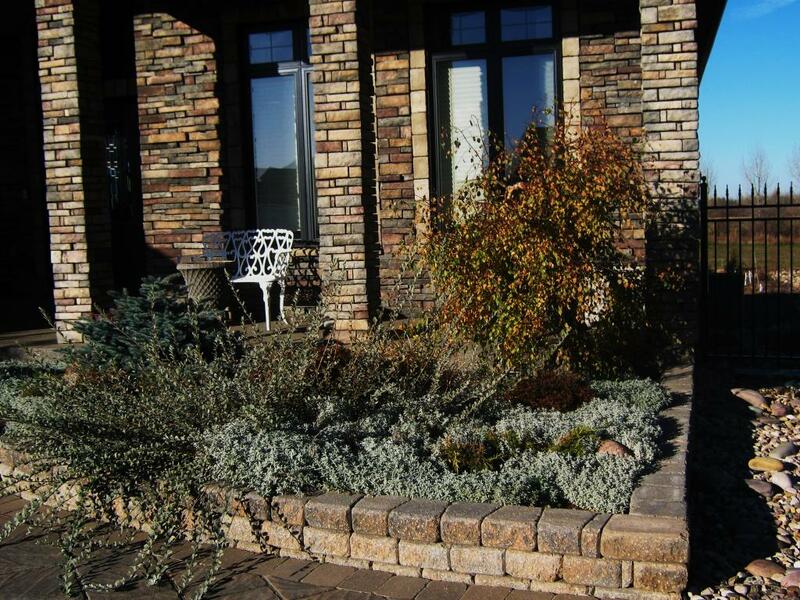 When you entrust us with your yard, you are receiving the benefit of vast experience in the landscape trade. 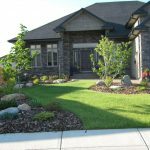 By taking the time to understand the needs and tastes of each homeowner, we are able to consistently deliver a design which is unique and impressive. 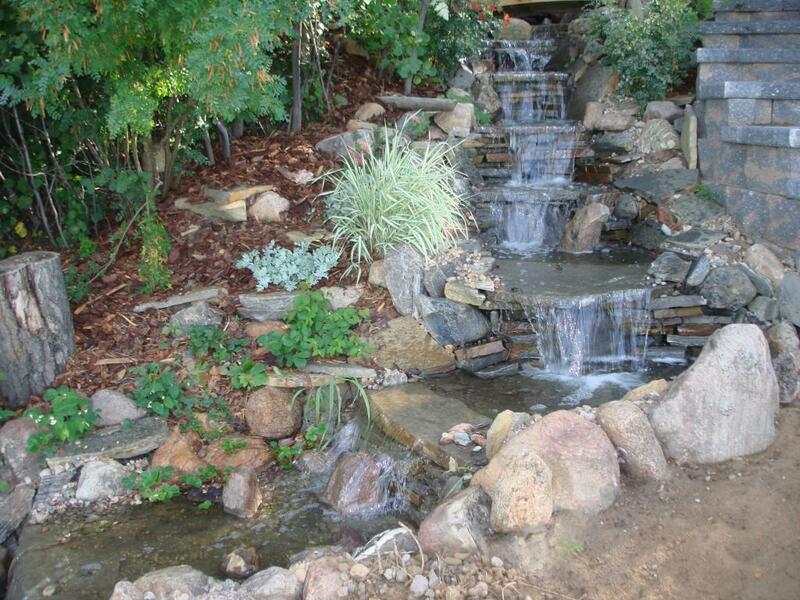 The relaxing sound of cascading water provides soothing reprieve from the hustle and bustle of daily life. 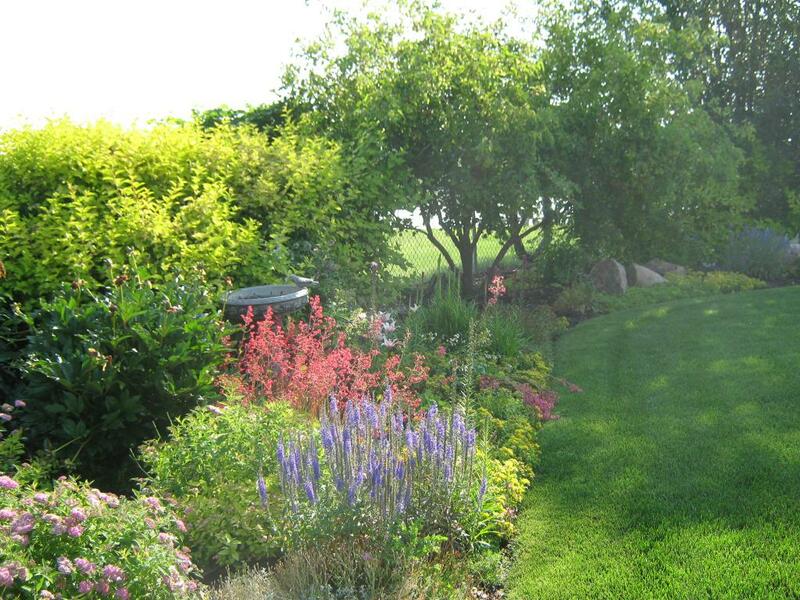 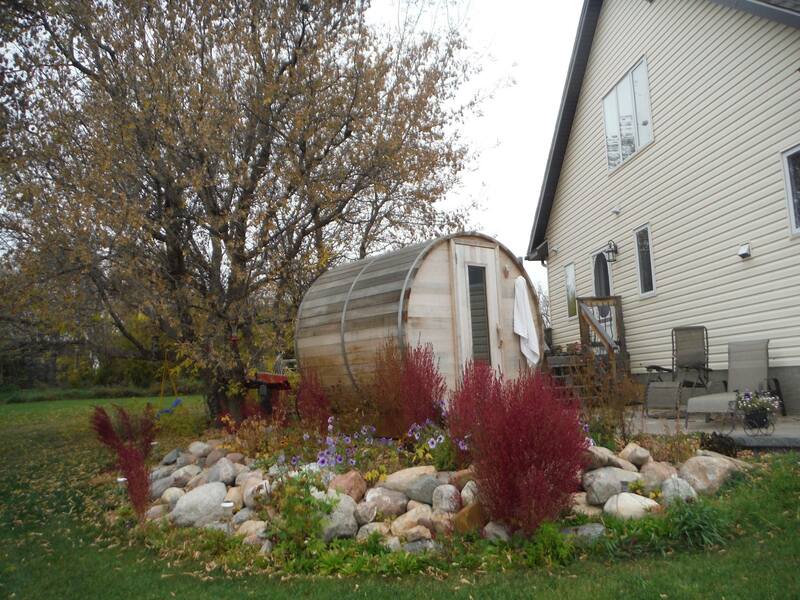 Picture your back yard as a sanctuary where you can escape and recharge your weary batteries. 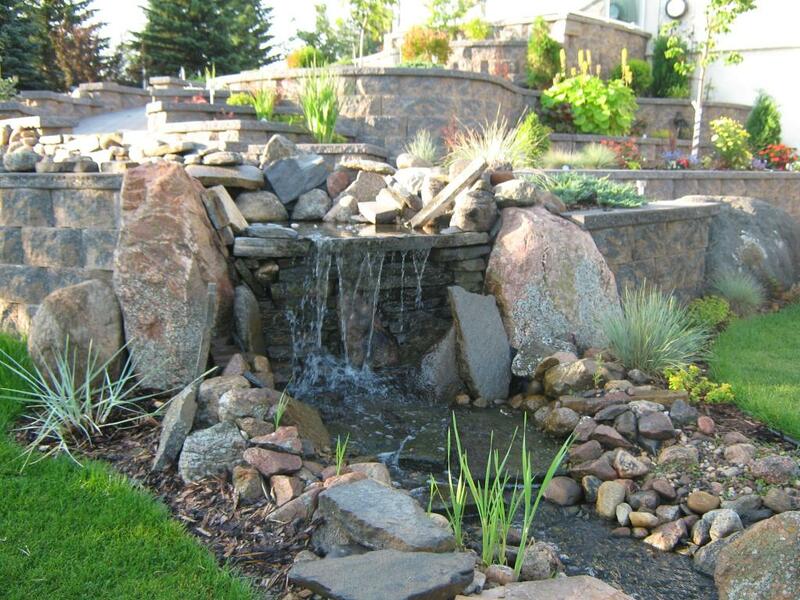 Water features can be created to suit any yard. 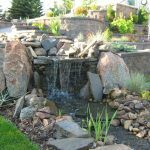 We have the experience and knowledge to create a trouble-free water feature from small and quaint to large and magnificent. 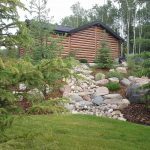 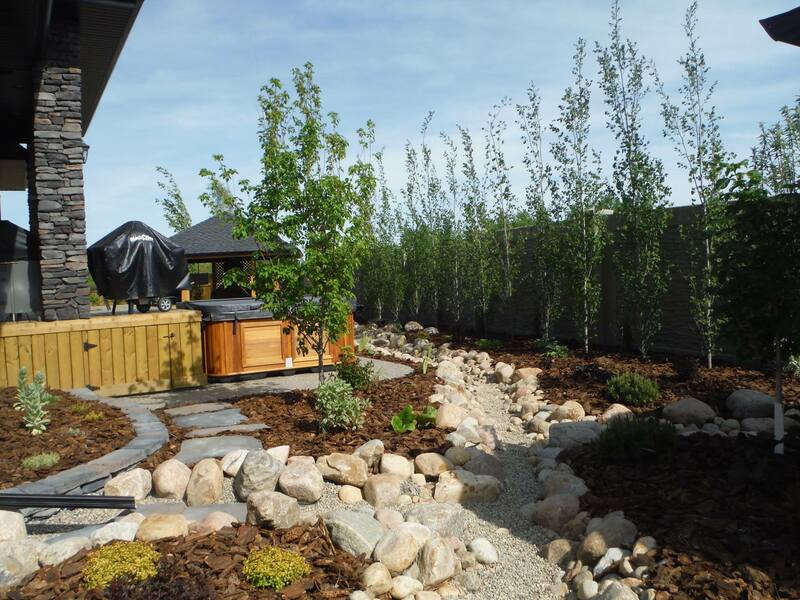 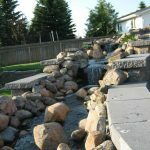 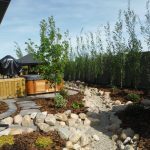 Pondless waterfalls provide all of the benefits of a water feature without the issues that arise with standing water, such as algae and mosquitos. 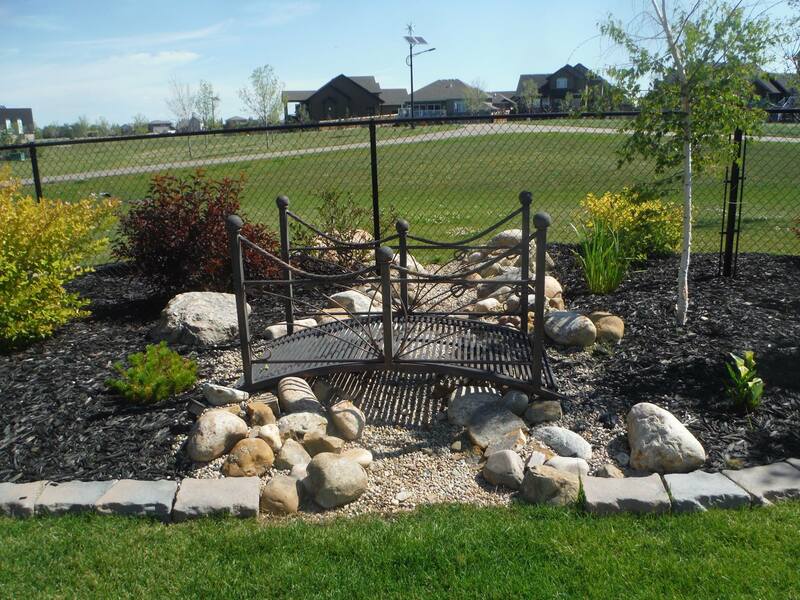 By having an underground reservoir we also alleviate the dangers a pond can present for small children and pets. 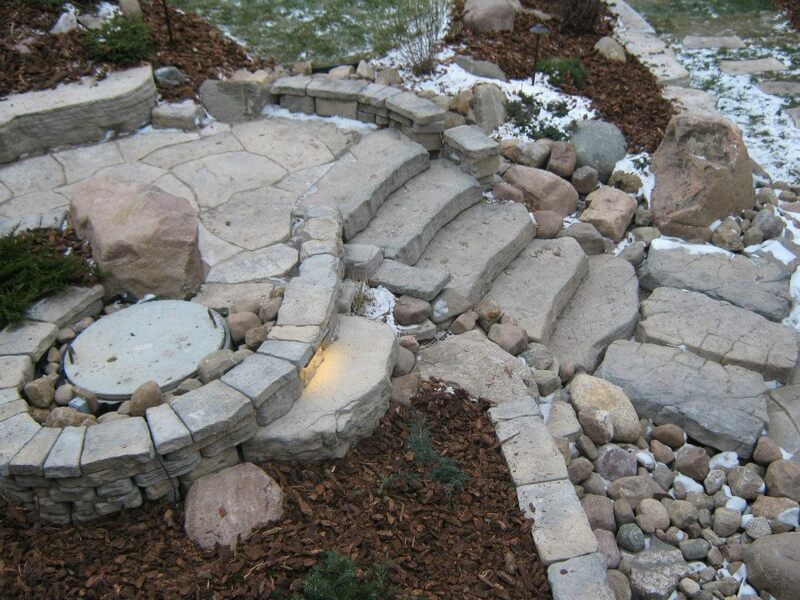 All water features require a GFI receptacle in close proximity for the pump and for lighting. 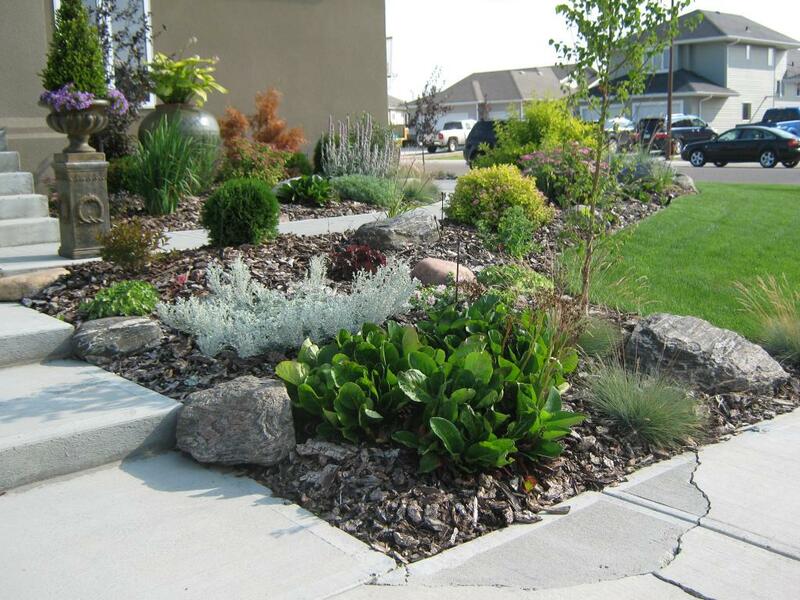 The plug should be 24” above ground level to be safe and meet code. 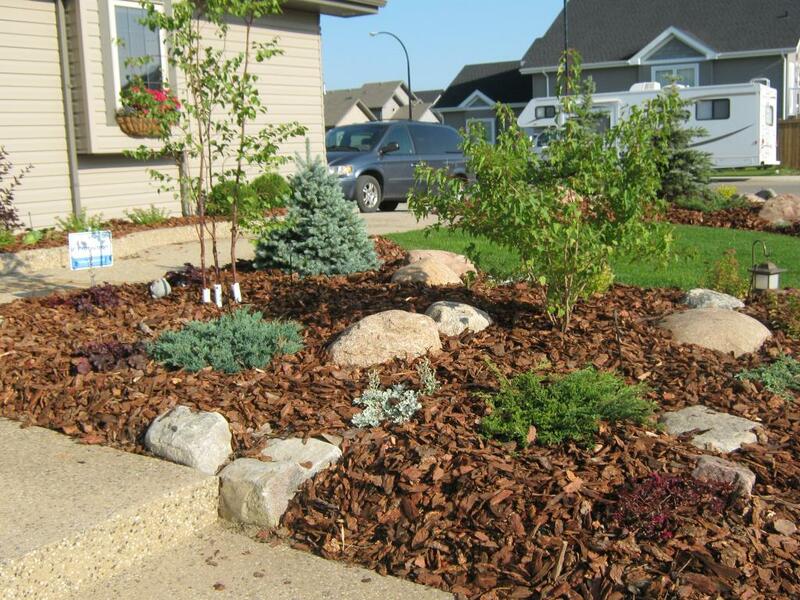 There is a wide range of ornamental plant materials which are reliable for our climate. 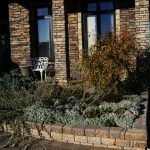 Plants are selected for size, location, texture, color, flowers, and winter effect. 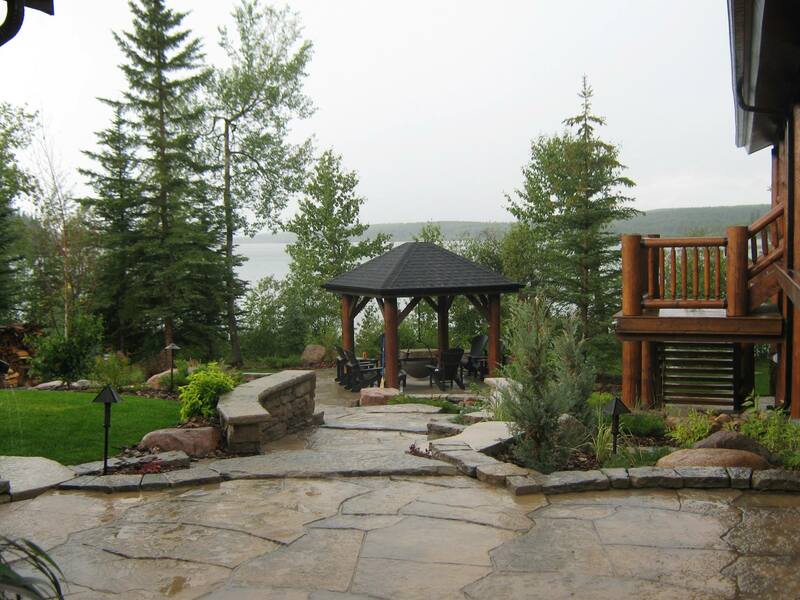 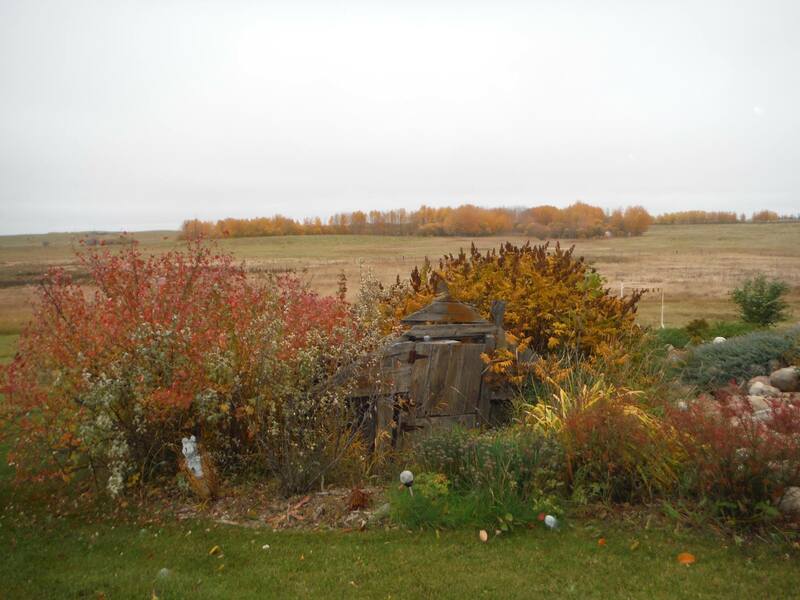 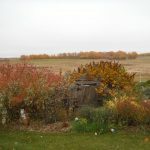 A great landscape has structure and interest for all four seasons. 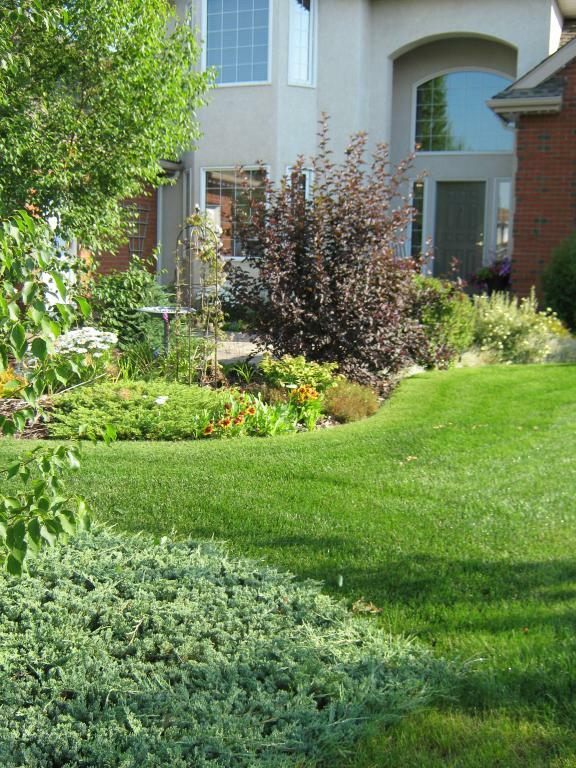 Plant breeders are constantly introducing new varieties of ornamental plants. 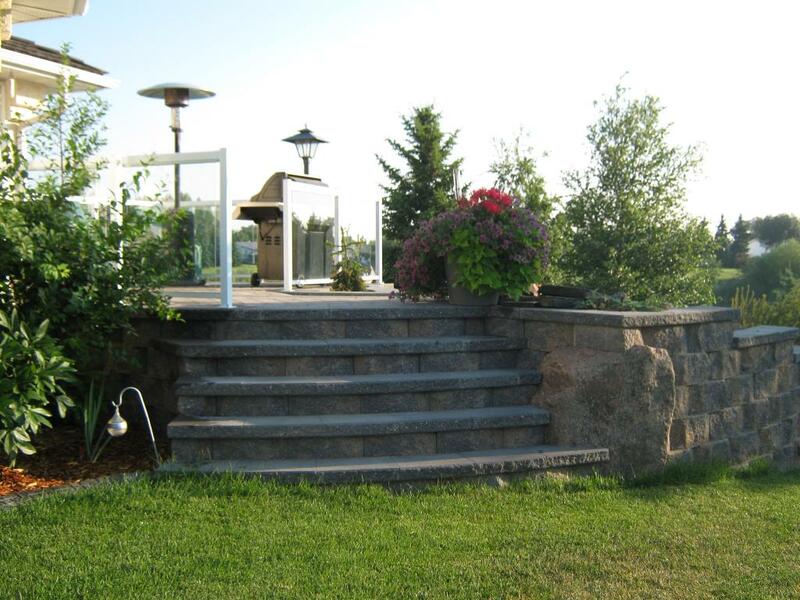 We are always on the look-out for something new and exciting to incorporate into our projects. 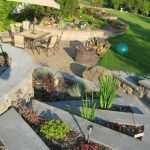 Selecting plants for a specific location means understanding the amount of sunlight available, the mature size of the plant, and how it will relate to the plants around it. 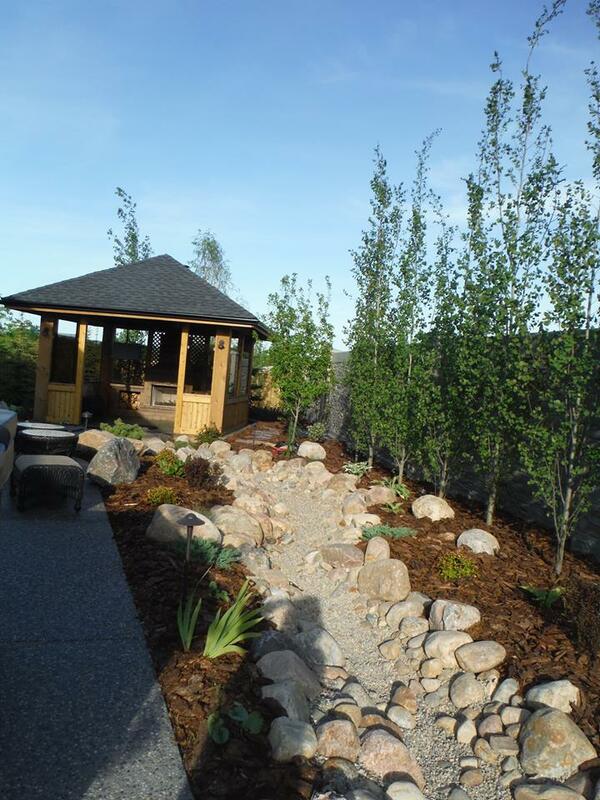 Plants are soothing to the senses and helpful in removing carbon dioxide from our atmosphere. 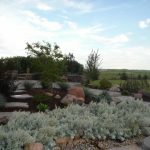 Plants need quality soil and soil amendments to perform to their full potential. 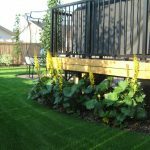 Investing in proper bed preparation means stronger, healthier plants that will continue to flourish and enhance your lifestyle. 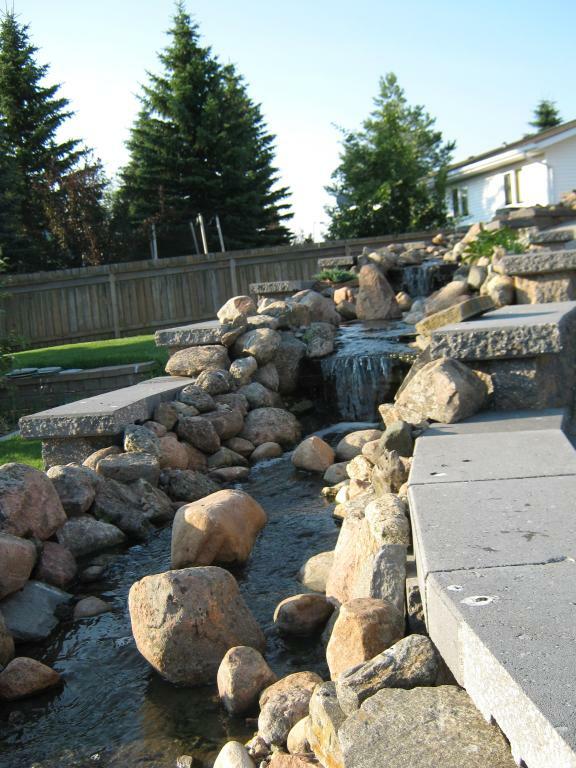 Function and beauty come together as one when solving drainage issues with a dry creekbed. 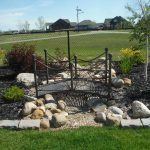 Proper drainage is a primary concern for all homeowners. 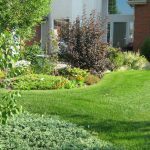 Down-spouts, surface run-off , sump-pumps and neighboring yards all must be considered when creating a drainage plan. 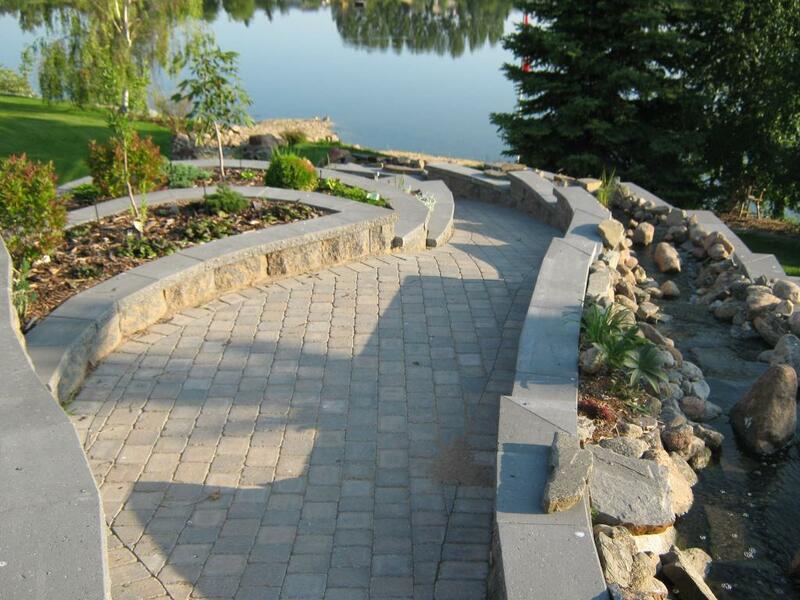 The successful direction of water flow is the backbone of any good design. 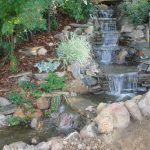 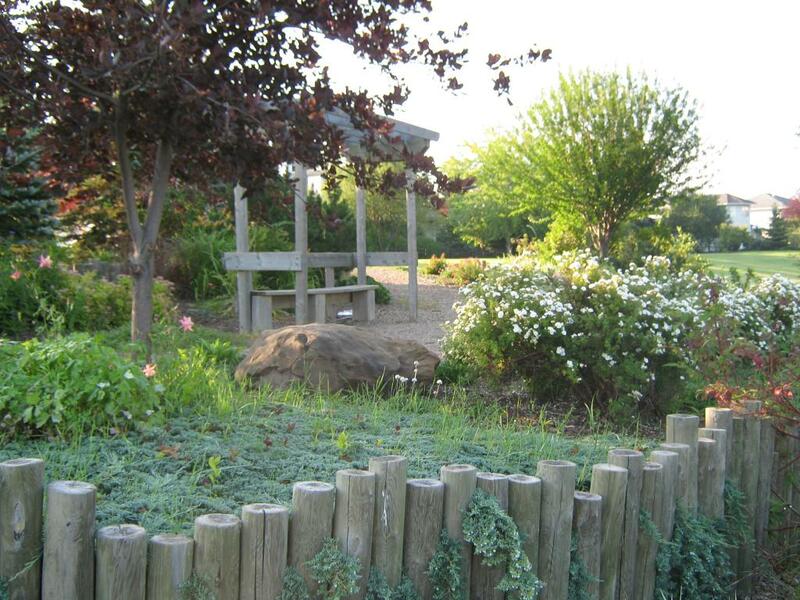 By creating dry Creek-beds, we are able to stop erosion and contain and direct water. 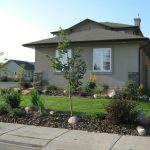 Anticipating and preparing for rain and spring run off is imperative to avoid situations which threaten basement windows and walk-out basements. 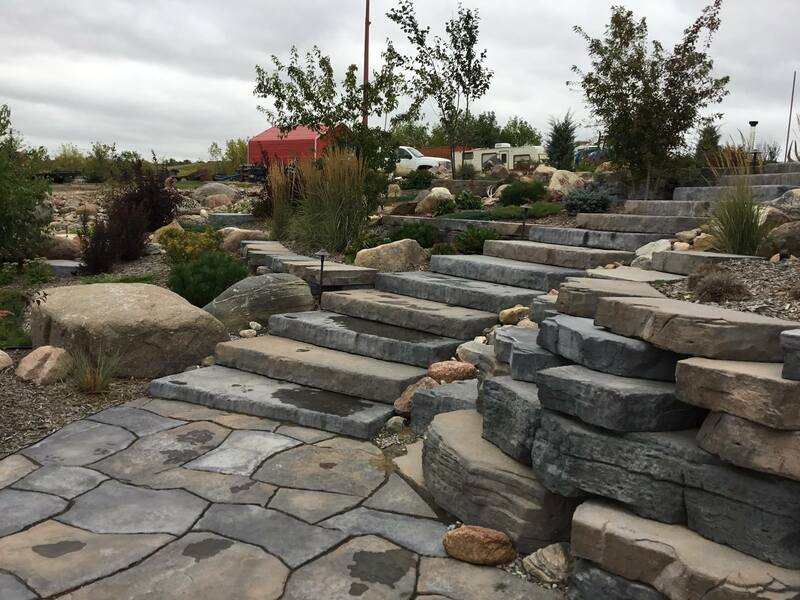 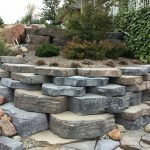 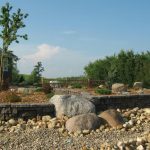 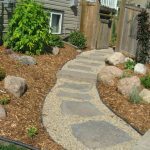 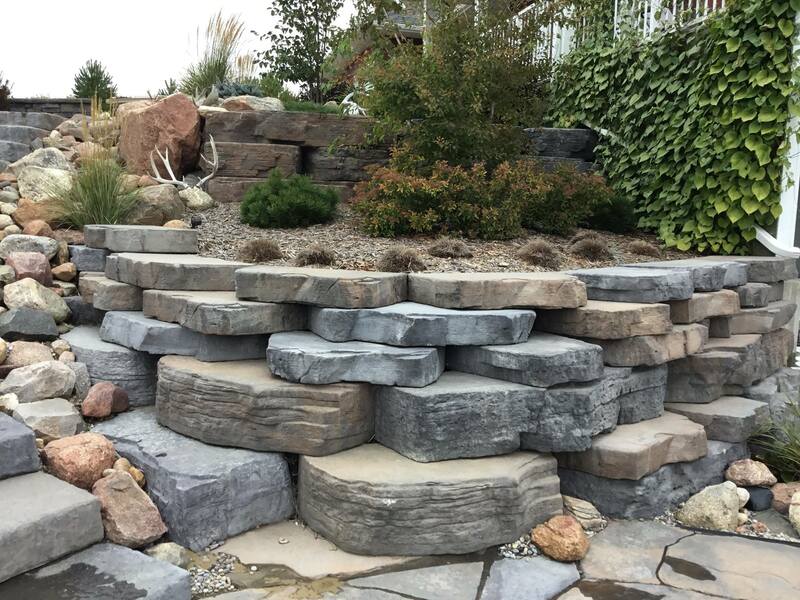 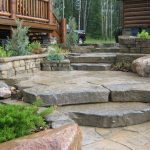 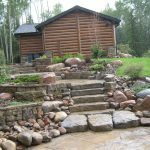 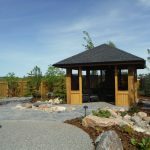 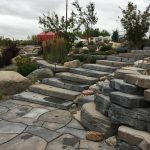 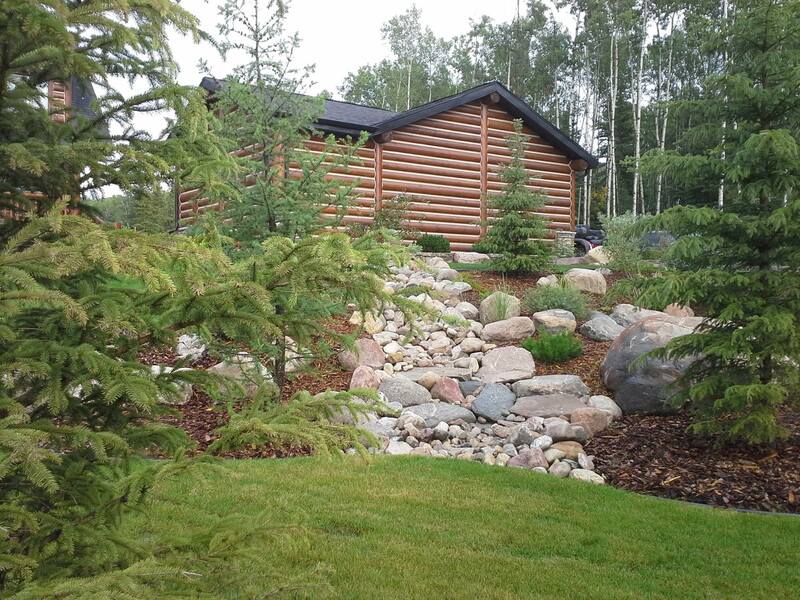 Using an array of sizes and shapes of rocks and boulders allows us to create a natural and appealing landscape feature. 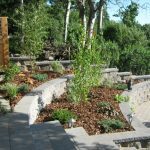 Terraced yards are the most difficult and expensive landscapes to construct. 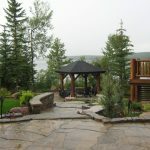 Walk-out basements and lake lots are most often requiring of such treatment. 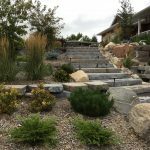 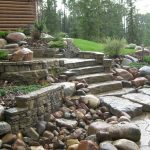 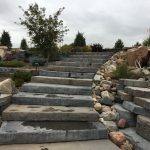 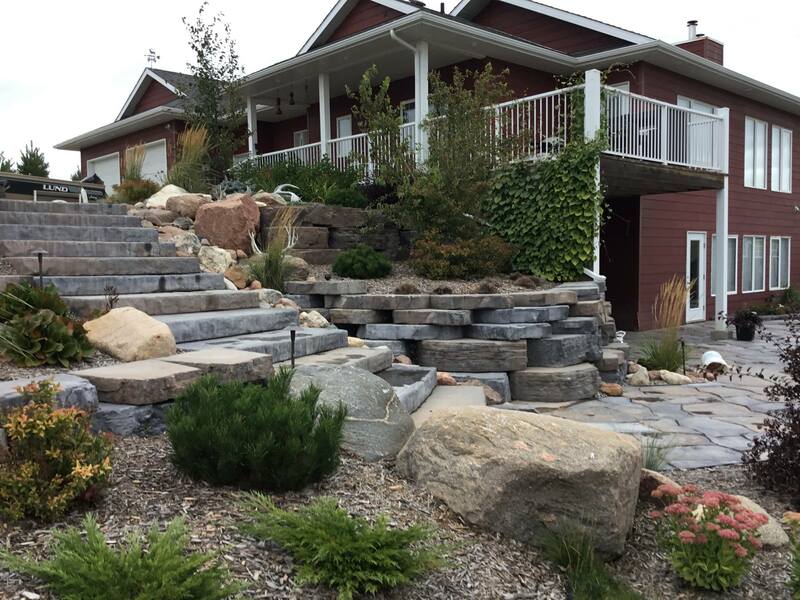 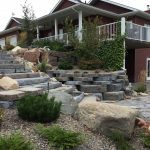 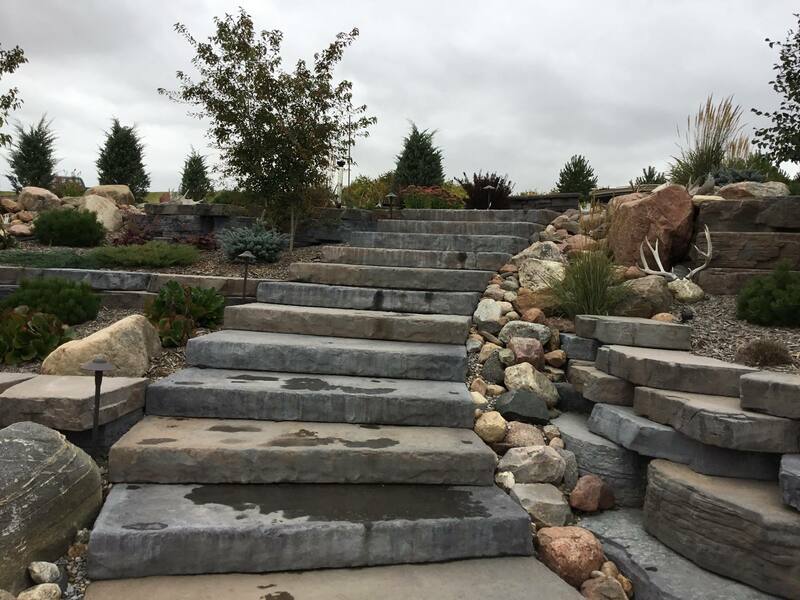 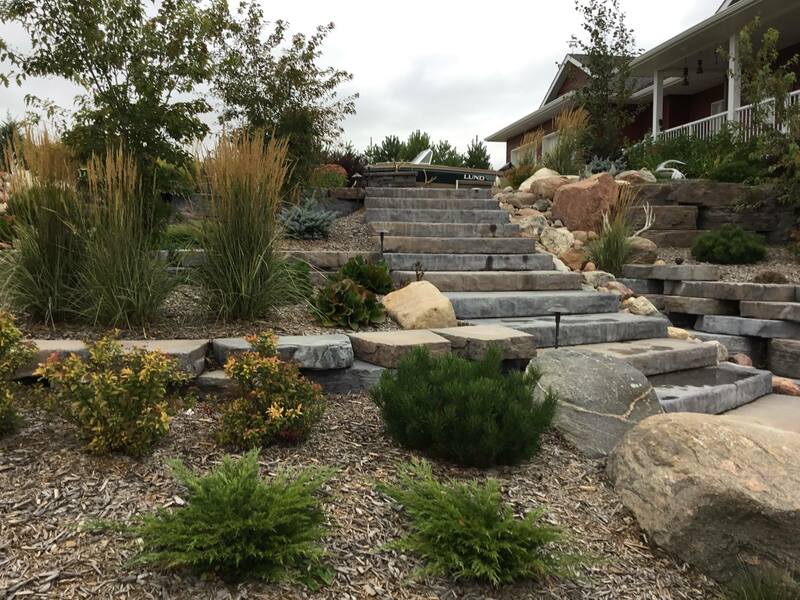 The design and construction of retaining walls and steps must be carefully considered and detailed to provide a functional and stable result. 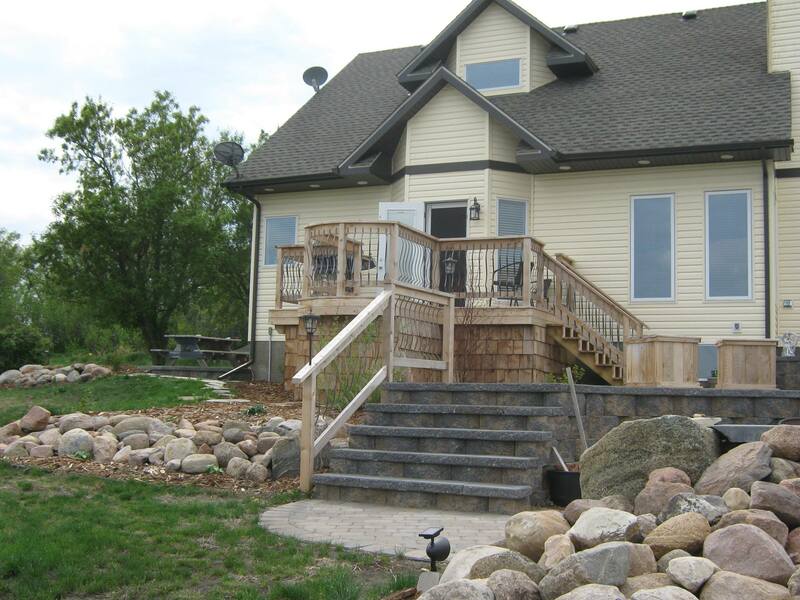 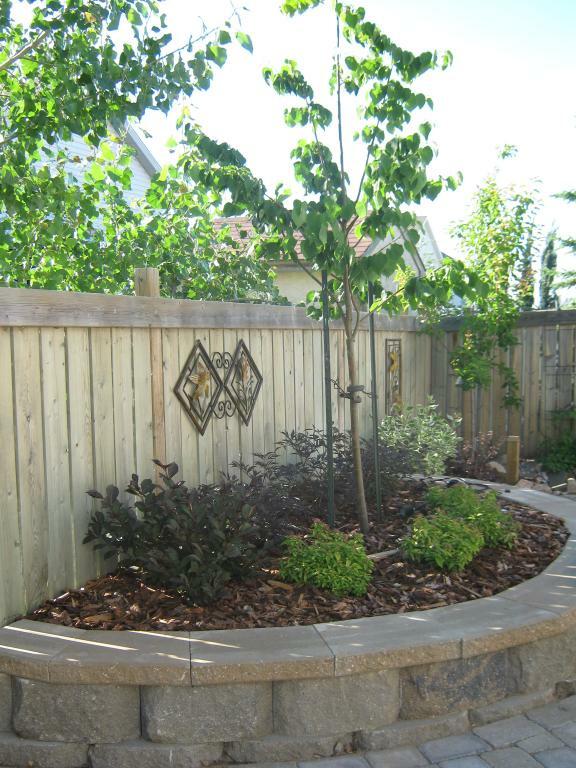 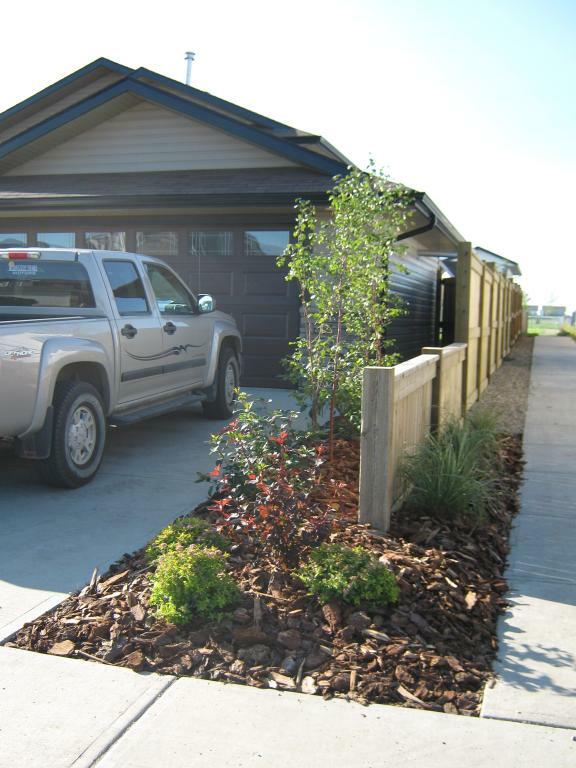 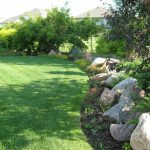 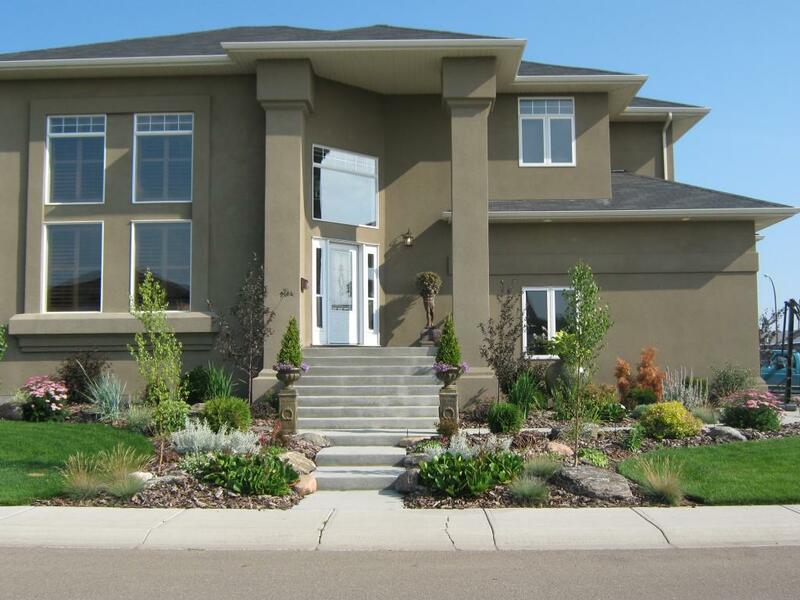 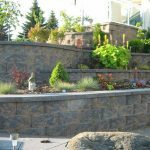 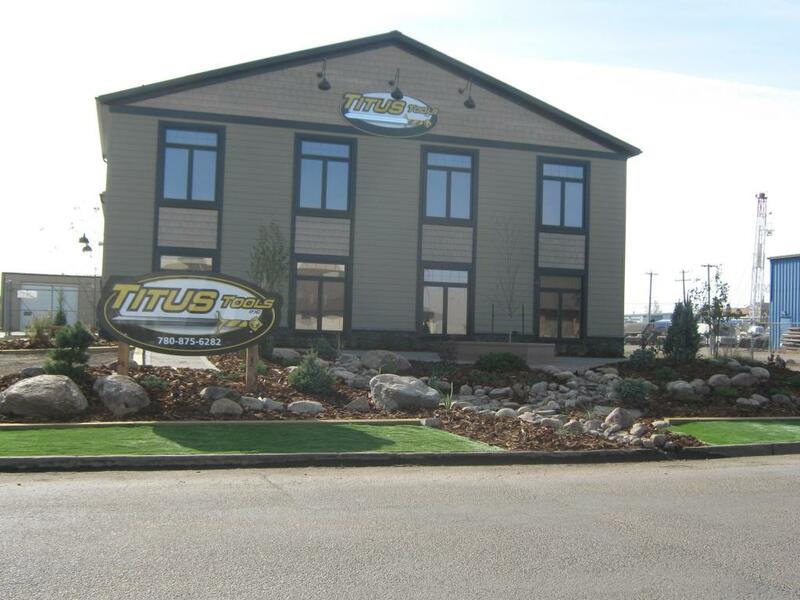 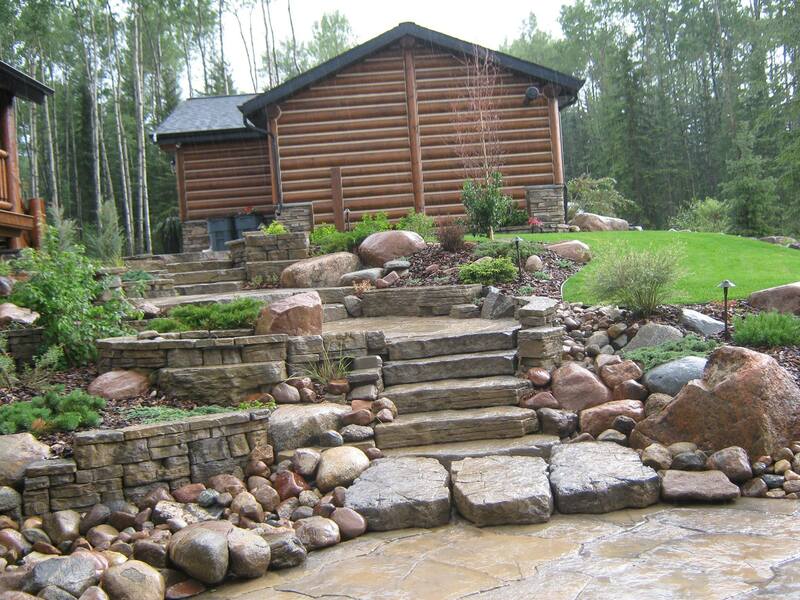 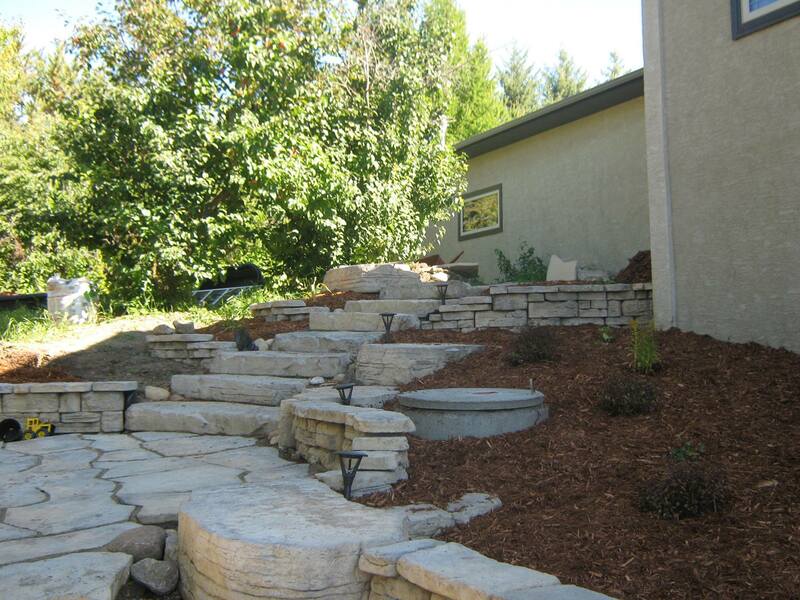 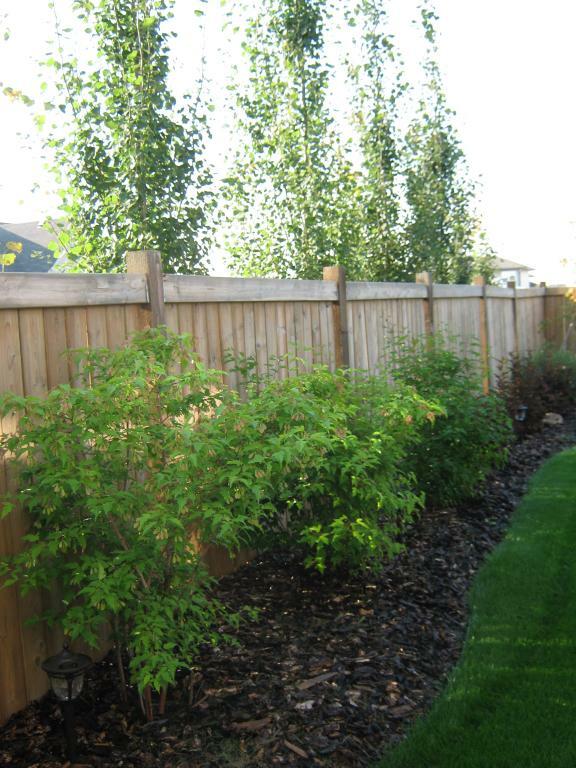 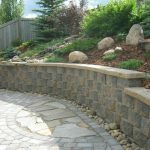 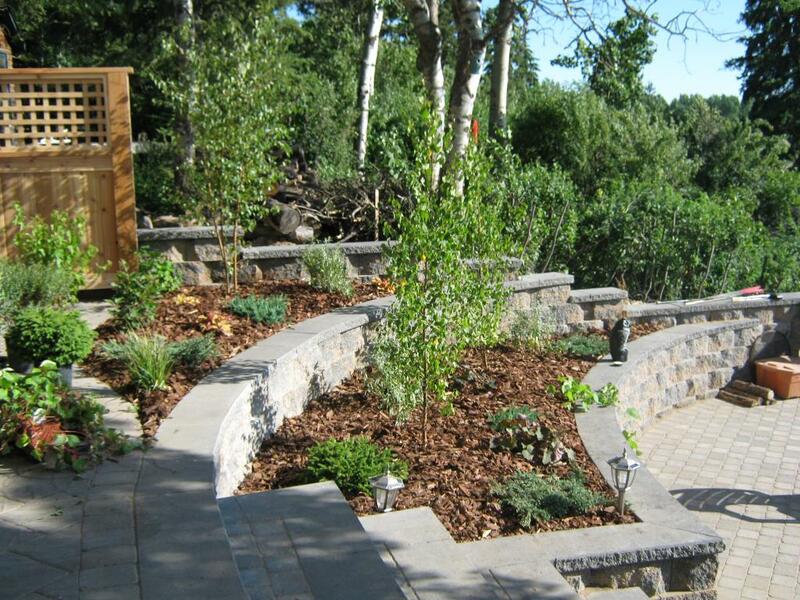 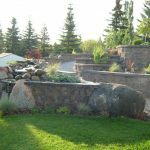 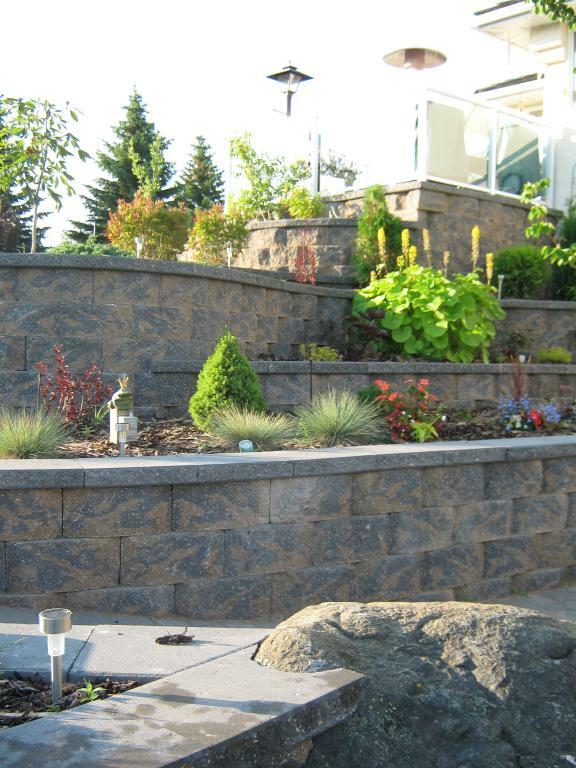 There are numerous retaining wall systems available and each has limits to the height of wall. 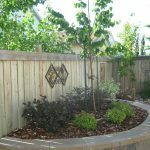 Generally, the smaller the block, the lower the wall. 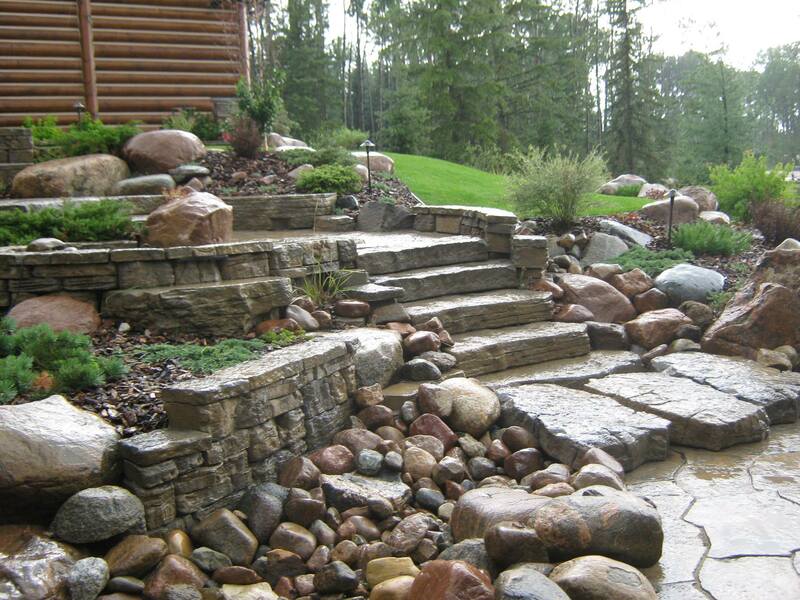 We will recommend the most suitable products for the situation at hand. 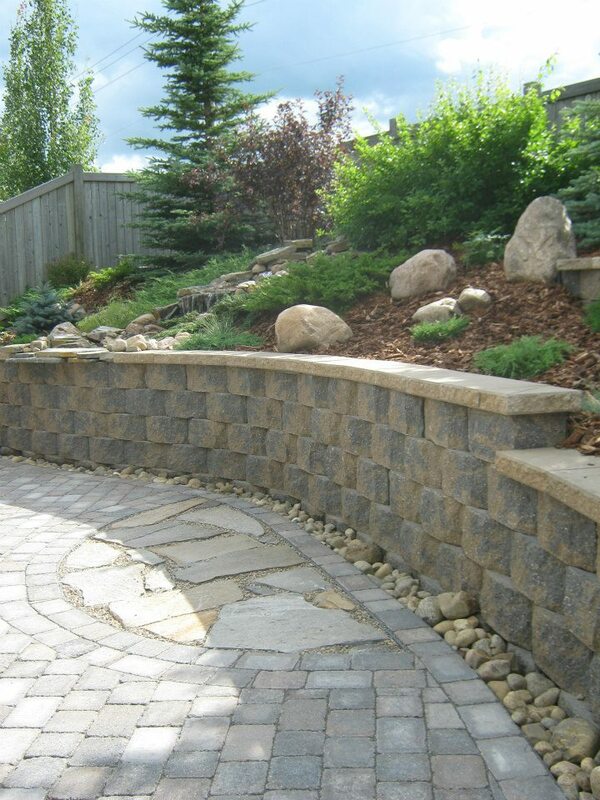 It is important for the product to contribute to the overall Landscape and to compliment the house. 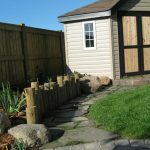 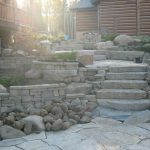 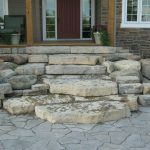 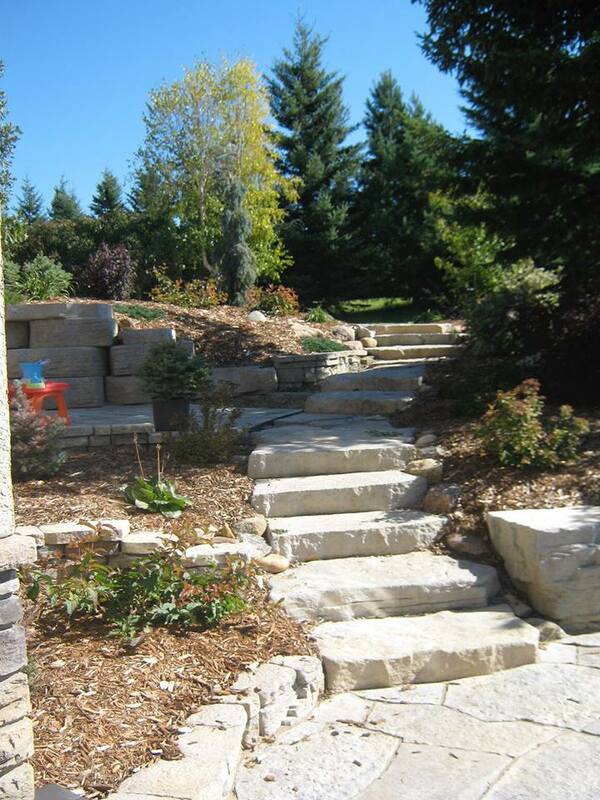 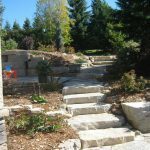 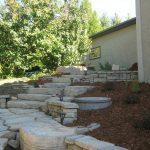 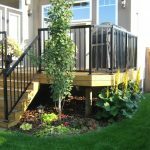 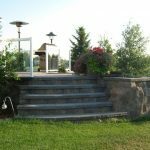 Retaining walls and steps are a permanent feature. 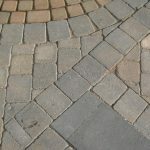 Skipping important details along the way is a mistake not worth making. 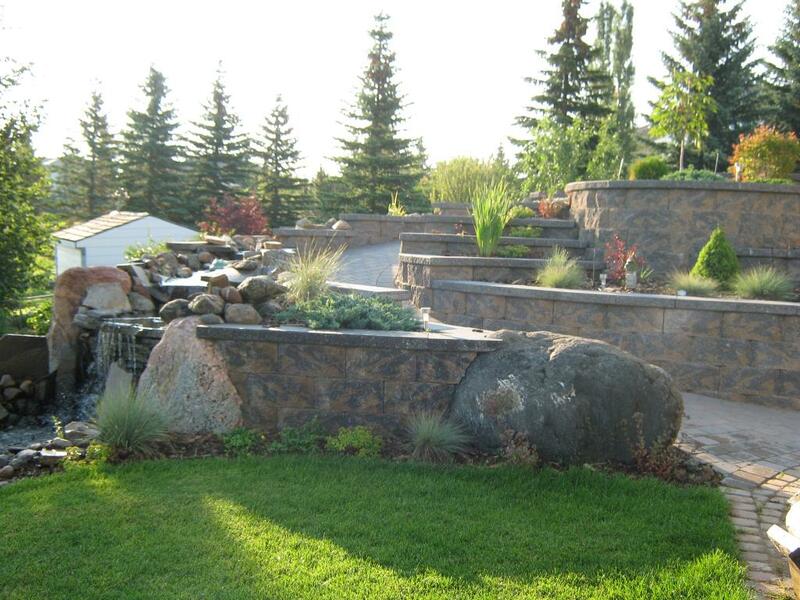 There is nothing more magnificent in the landscape than accent boulders. 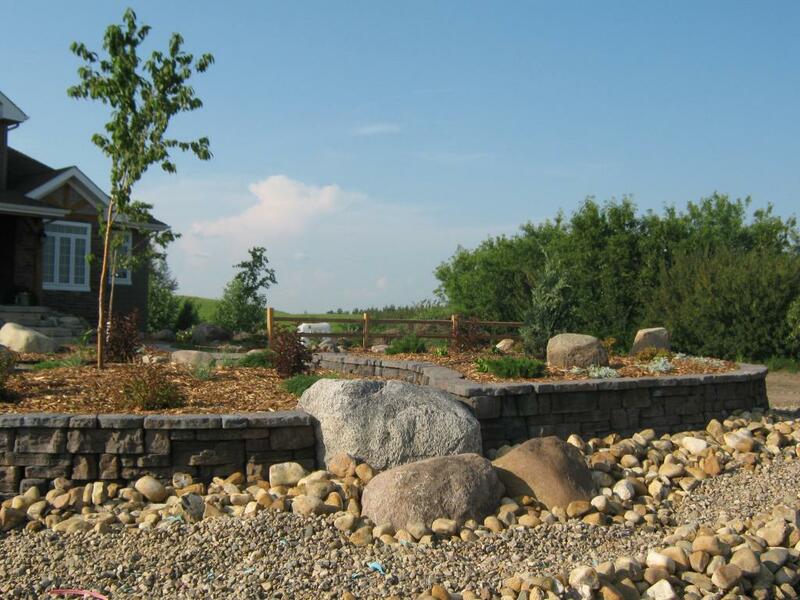 We love the texture, colors, and sense of permanence that boulders provide. 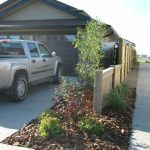 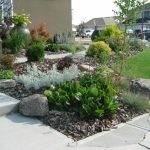 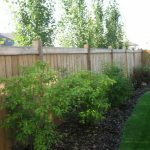 They naturally compliment the plants that surround them and have the ability to provide visual weight to the Landscaping. 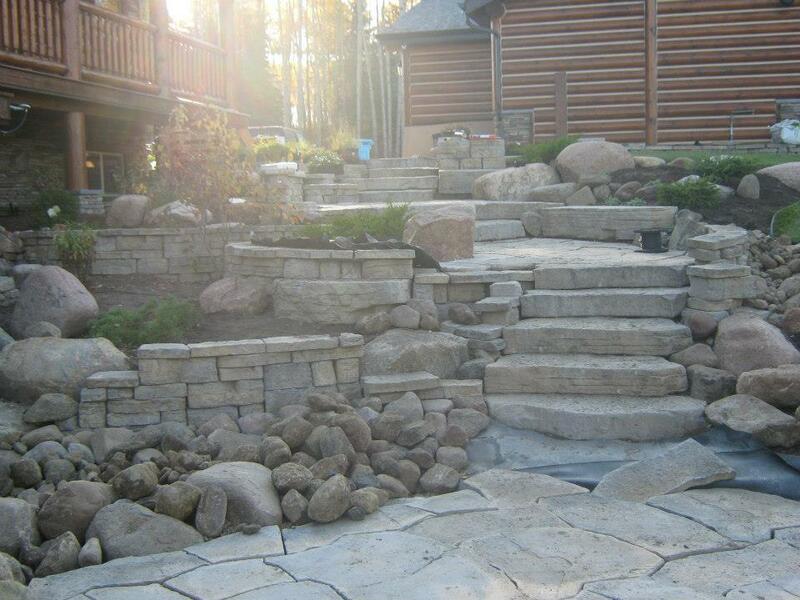 Placement and grouping of boulders to create a natural effect is a skill and talent we are proficient at. 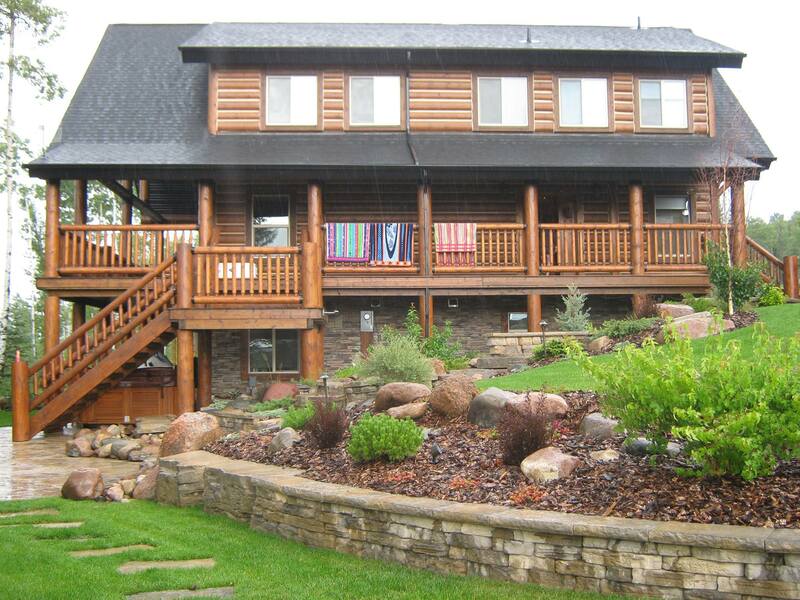 We love cedar! 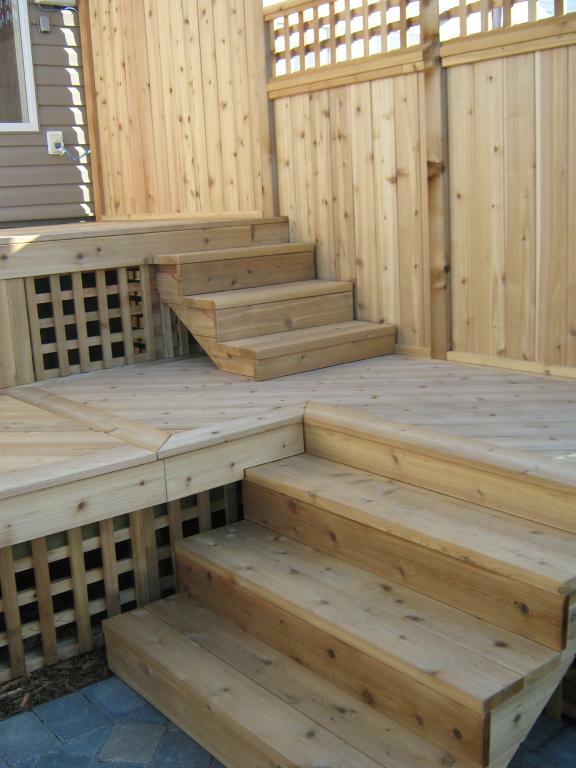 It is a natural, durable wood which is more attractive than treated wood and less expensive than composite products. 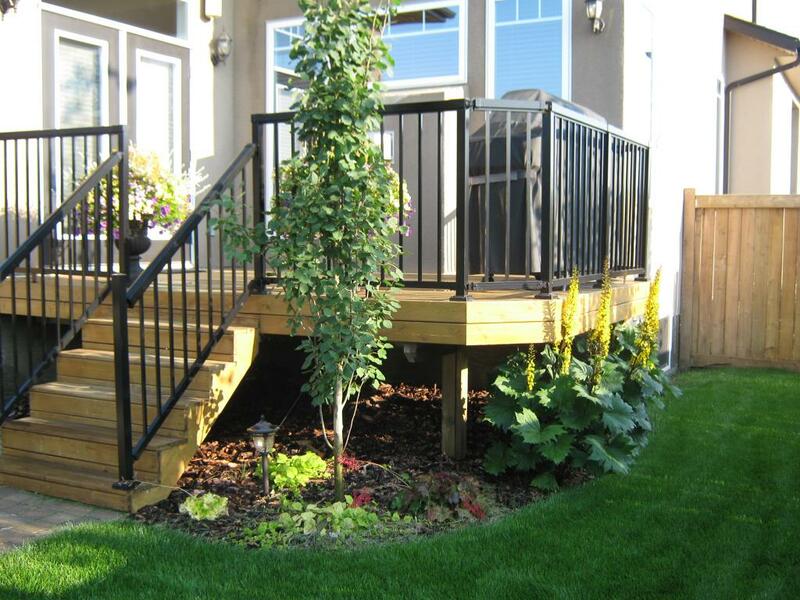 New developments in railings and finishes provide infinite possibilities to personalize your project. 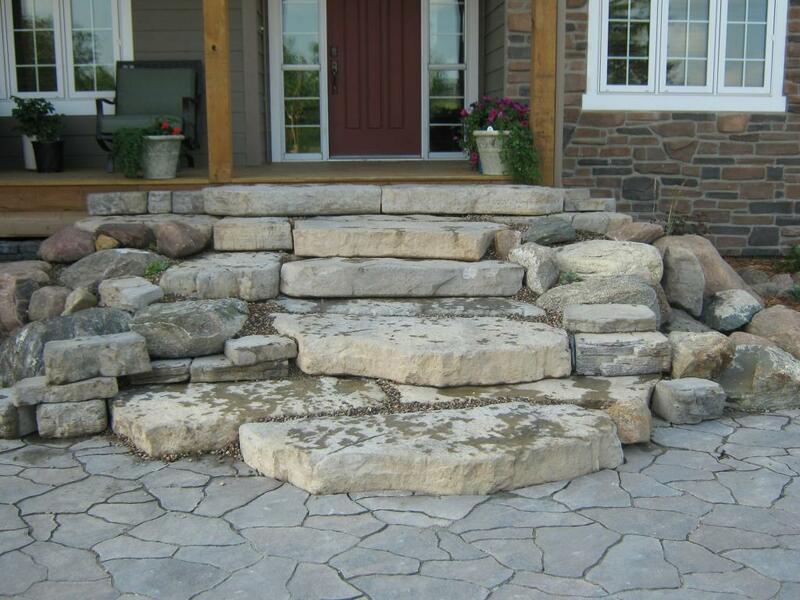 Steps should have a natural flow and be sturdy for safety. 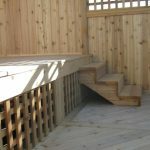 There are numerous ways to complete steps and staircases. 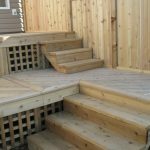 Our experience and training has provided us the skill and knowledge to construct stairs which are functional and attractive. 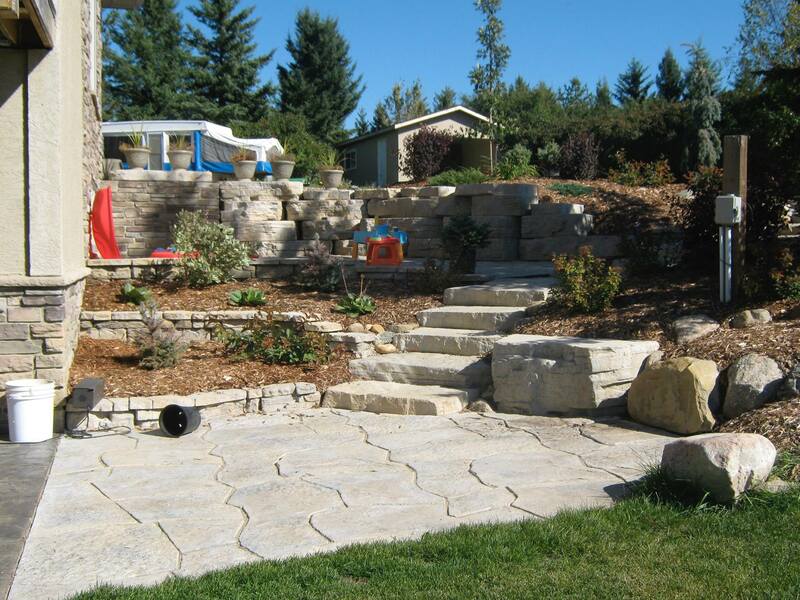 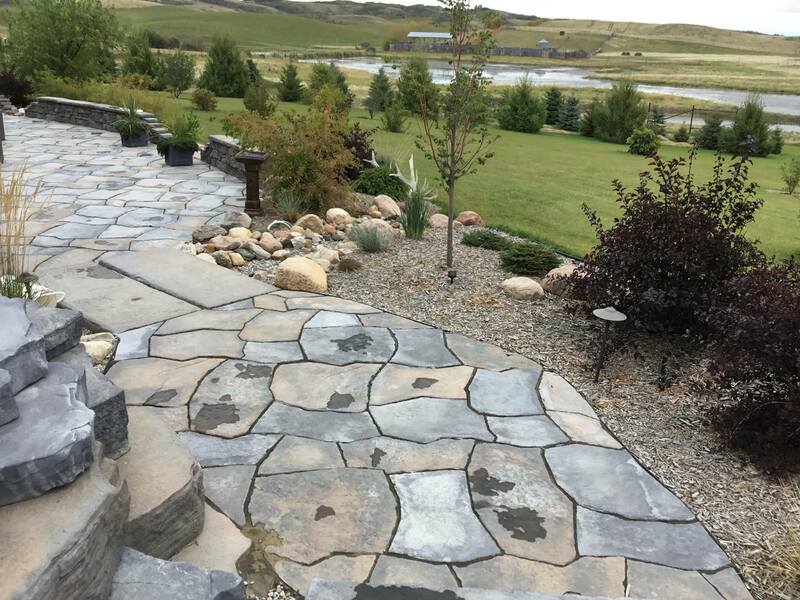 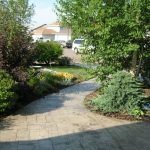 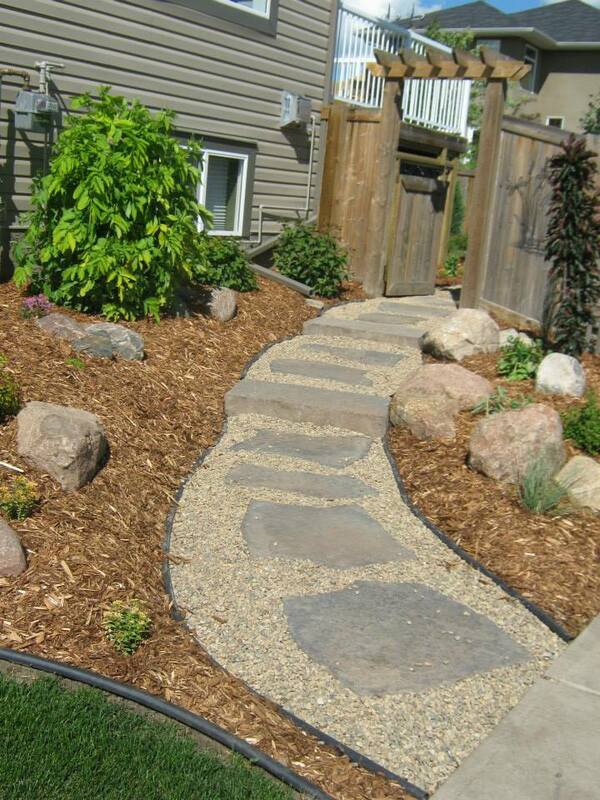 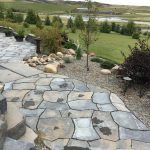 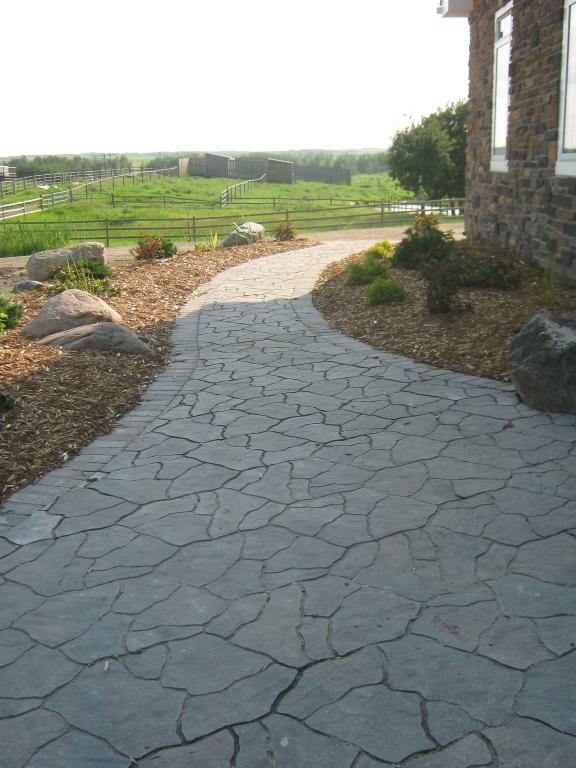 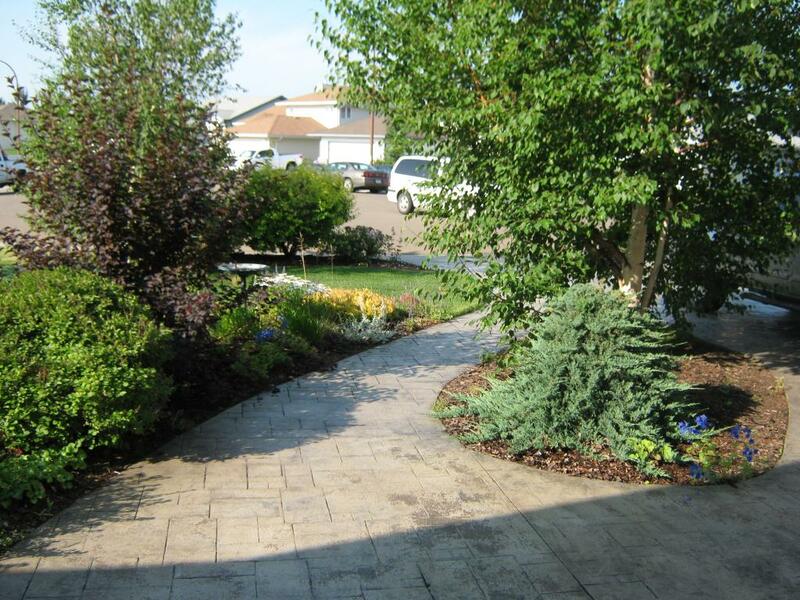 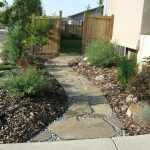 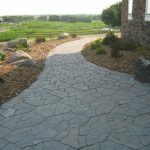 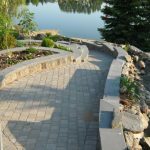 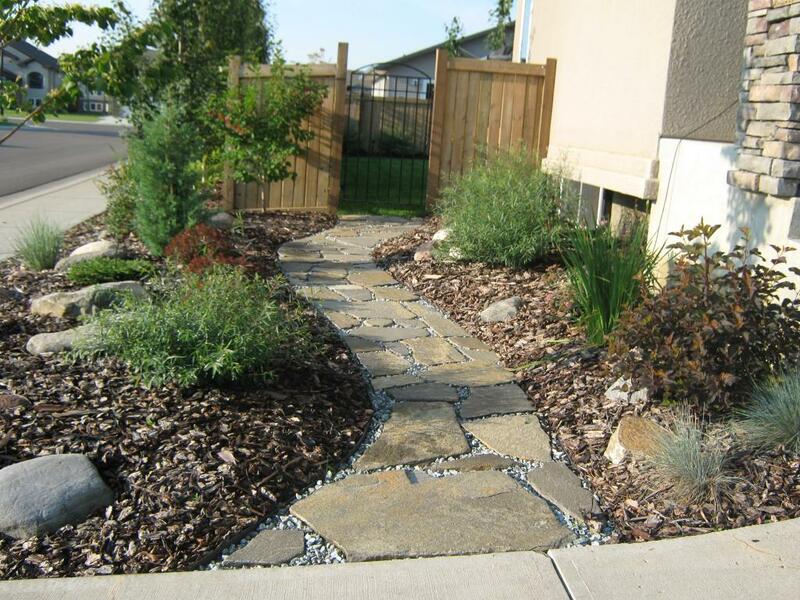 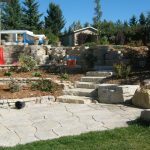 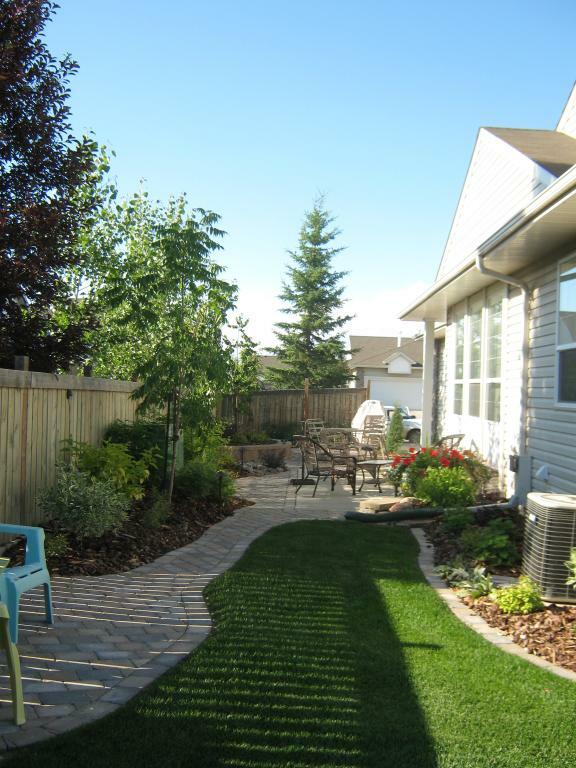 Patios, walkways and driveways can all be constructed with paving stone. 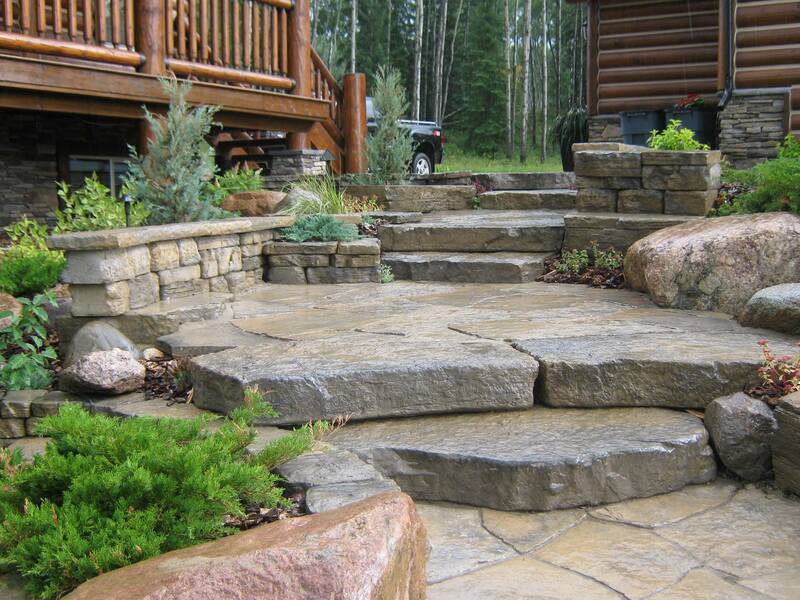 Although paving stone is more expensive than concrete, it is often preferred to add value and character to the yard. 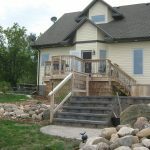 Base preparation is the most critical component for a sturdy, long-lasting project. 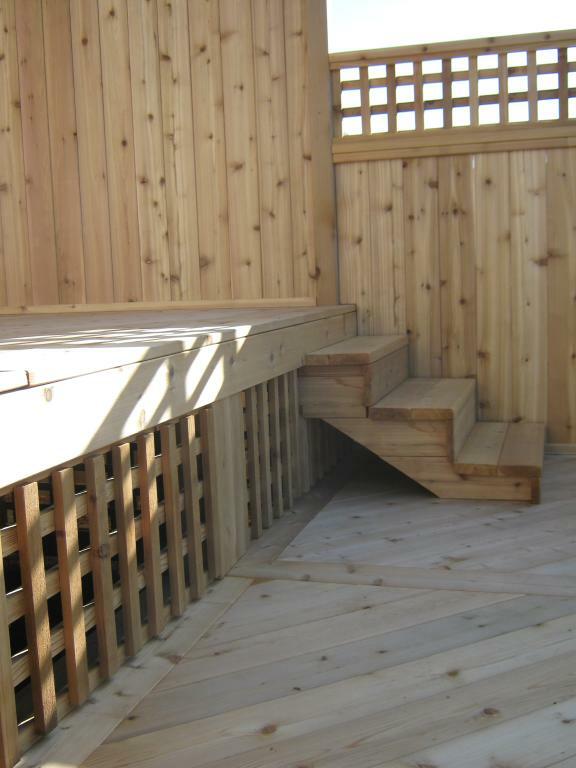 We take the time and use materials which provide the best possible base we can deliver. 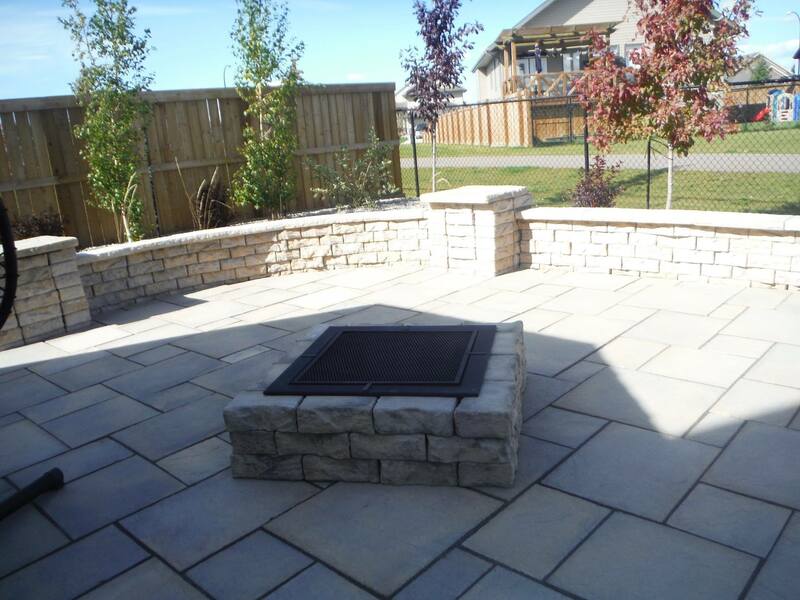 Our precision and pride of workmanship can be observed in all of our work. 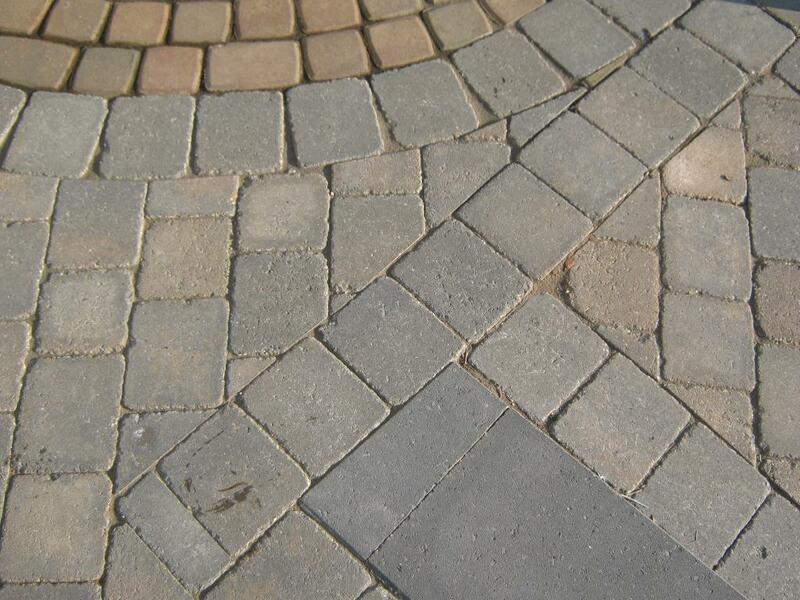 Sealing the gaps between the bricks with a polymeric sand prevents weed growth, insect problems and seepage of water. 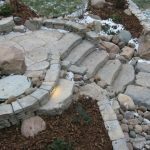 We are always on the look-out for new products which allow us to create unique projects which compliment the home and delight the homeowner.